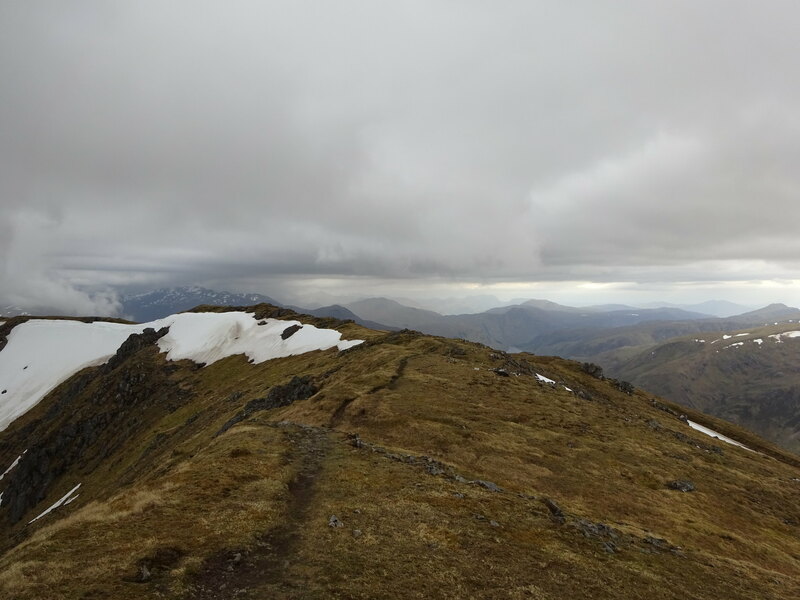 For the first trip of my munro holiday I usually plan a short and easy day, to get the legs used to walking up something bigger and steeper than my local hills. 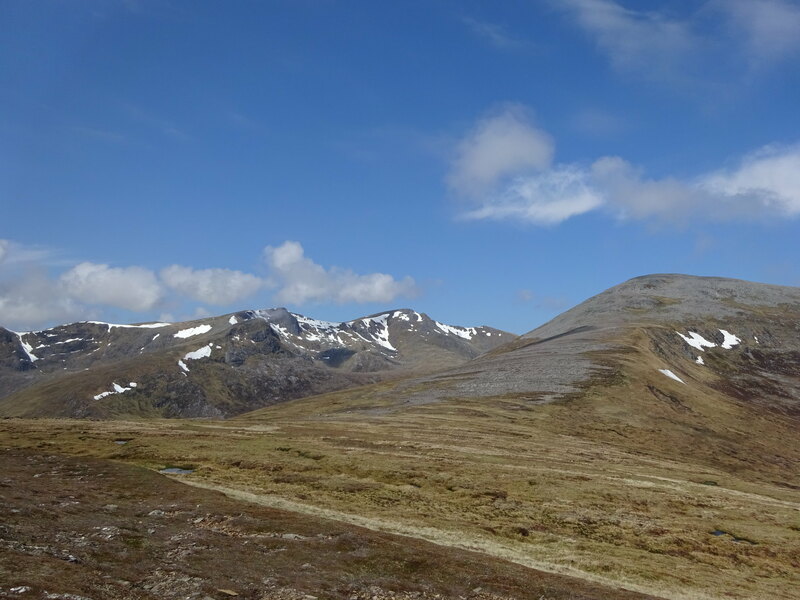 But the weather forecast for the next three days looked very promising, perfect for the Mullardoch Round. 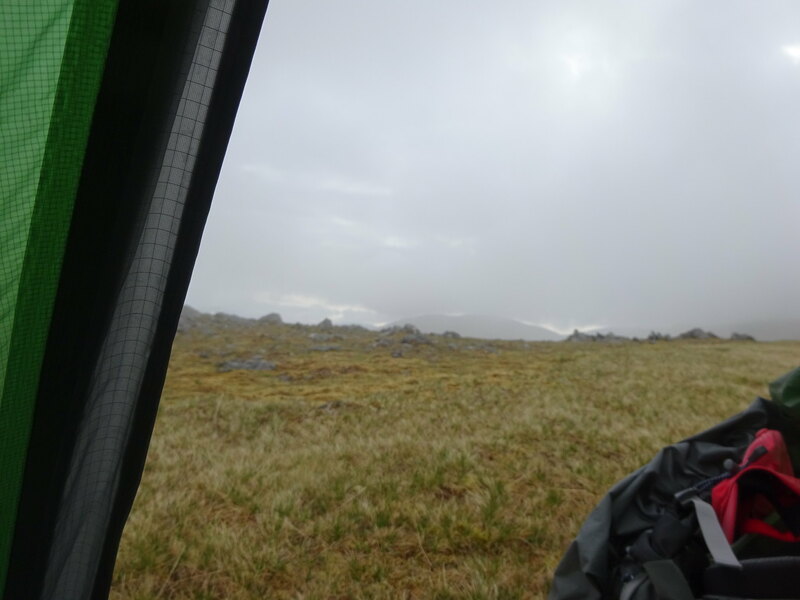 Last year the weather had scuppered most of my multiday trips, so this was just too good an opportunity to miss . 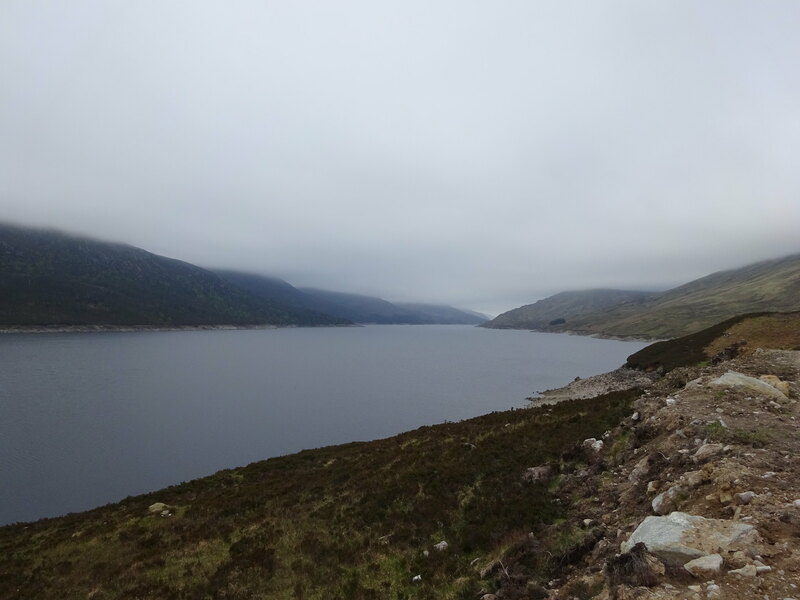 So with my 32 litre rucksack packed to (needless to say) full capacity for two overnighters I set off from the car park just before the Mullardoch dam. 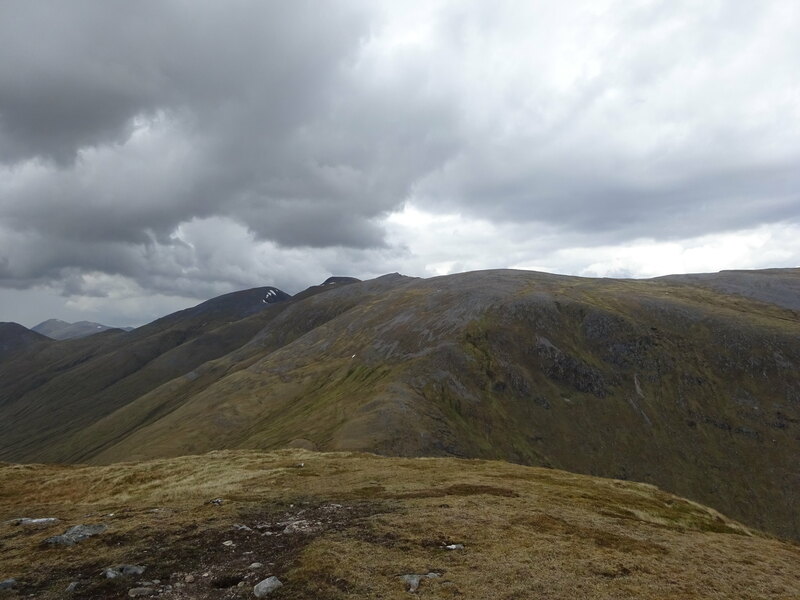 The weather was a bit dull, but hey as long as it was not snowing and blowing a hooley I wasn't going to complain! Once away from the busyness of the hydro works, I headed up along a stream bed. 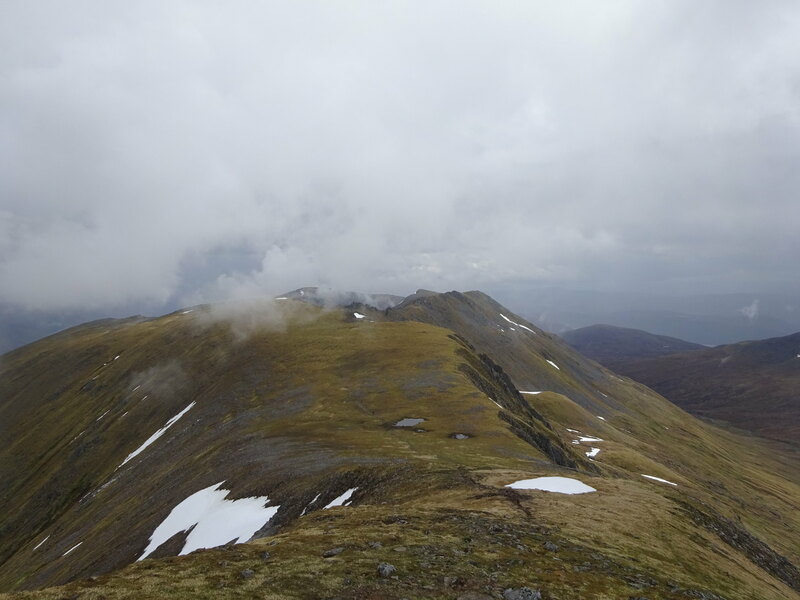 It was a steep, grassy and pathless slog, which luckily didn't last too long. As the gradient eased off, I noticed that the weather was improving. 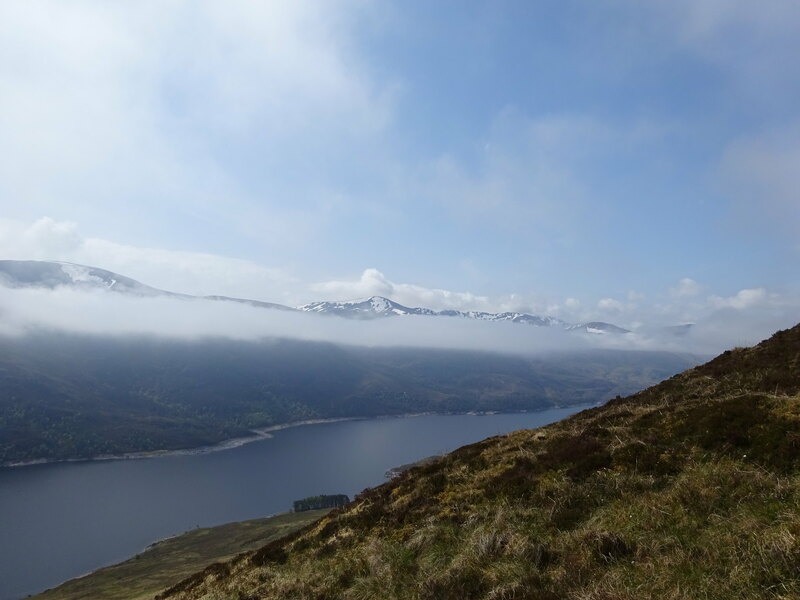 This side of the loch most of the cloud had burned off and on the other side there was an inversion. I don't usually get inversions on my trips, so I stopped for a while to marvel at the wonder of it. What a great sight! On Mullach na Maoile I found a black fleece gilet. 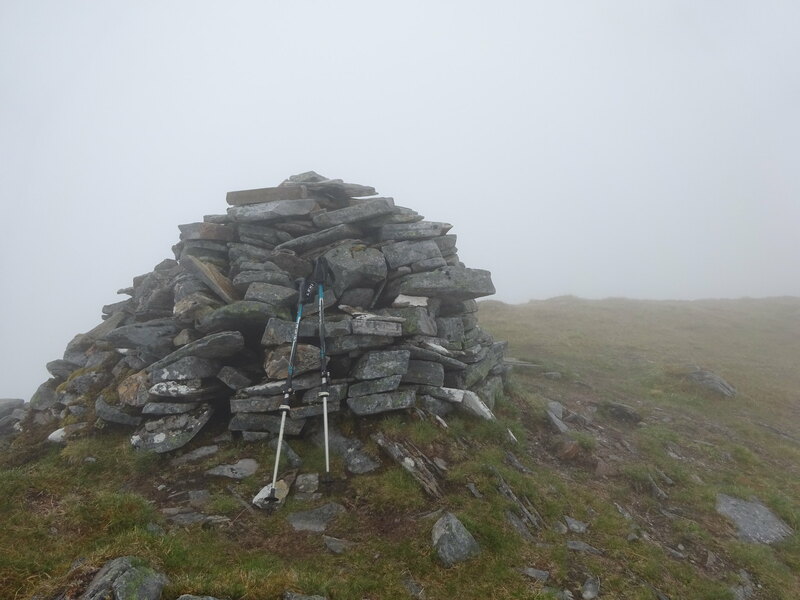 Maybe it belonged to the person ahead of me who had just made it to Carn nan Gobhar? So I took the gilet with me in the hope of catching up the owner and returning it. 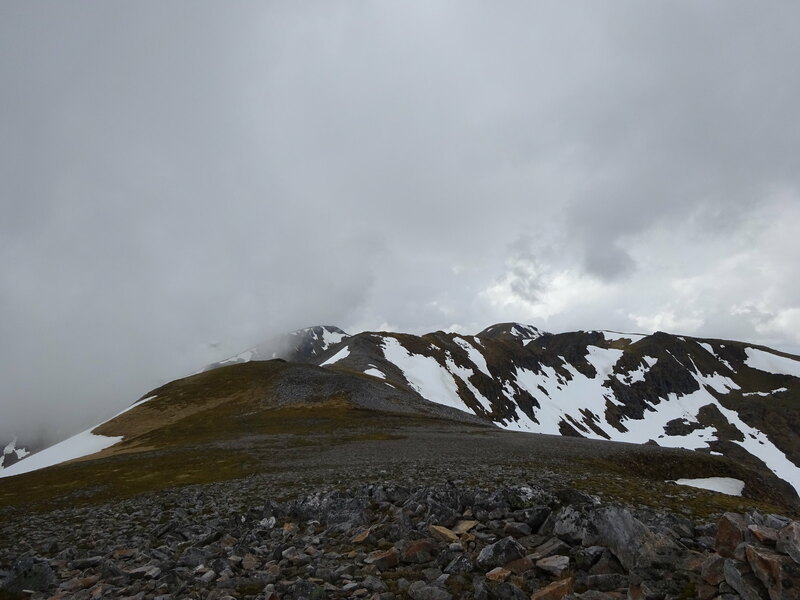 The going was now much easier on the stony hillside and once on the first summit the view towards the eastern corries of Sgurr na Lapaich was just magnificent. 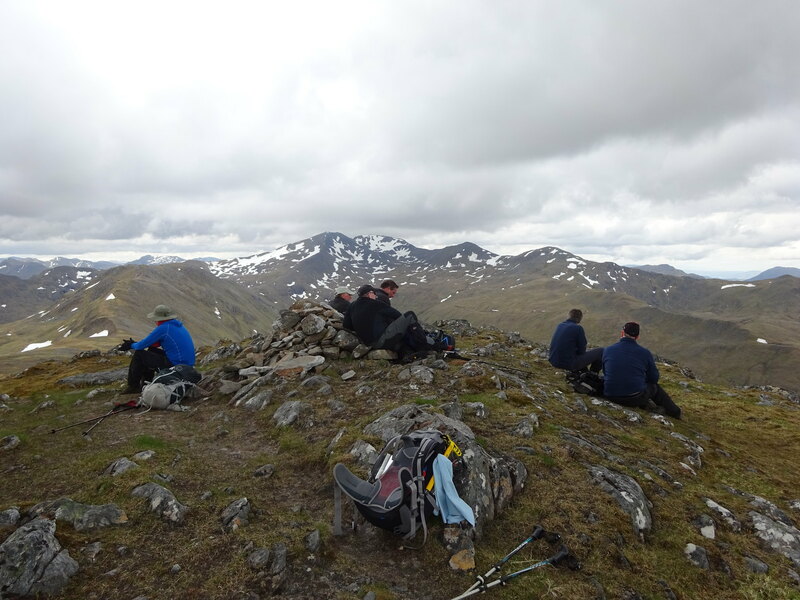 The true summit was only 5 minutes further on. 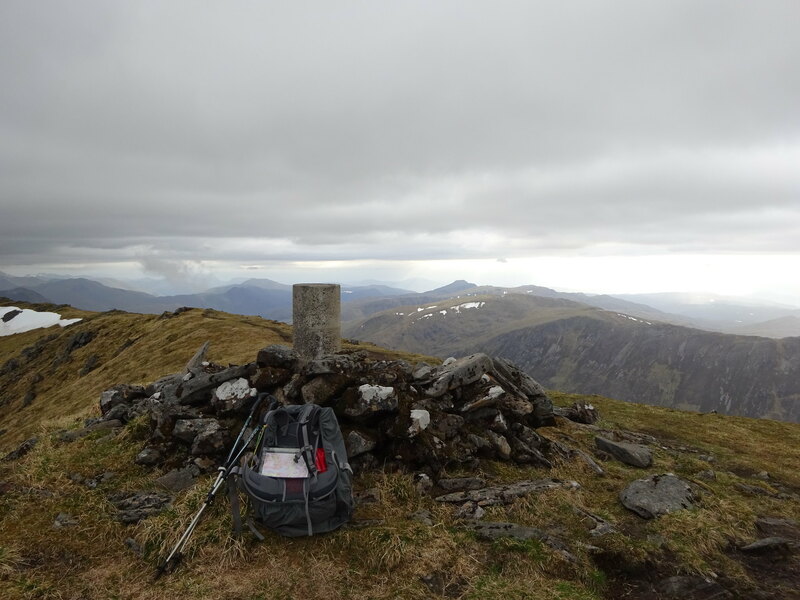 Carn nan Gobhar, first munro of 2016, great to be back! After a sip of water and a few oatcakes with nutella it was camera time! 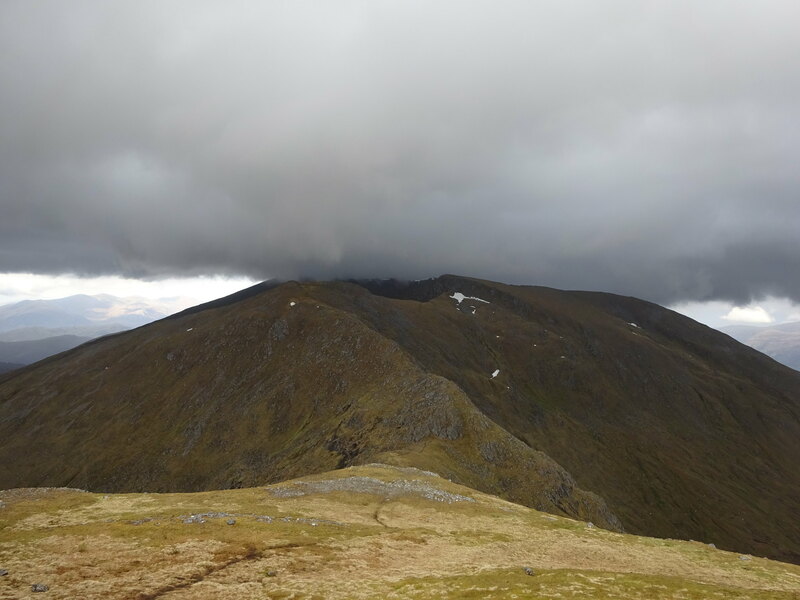 The climb towards Sgurr na Lapaich looked intimidating. 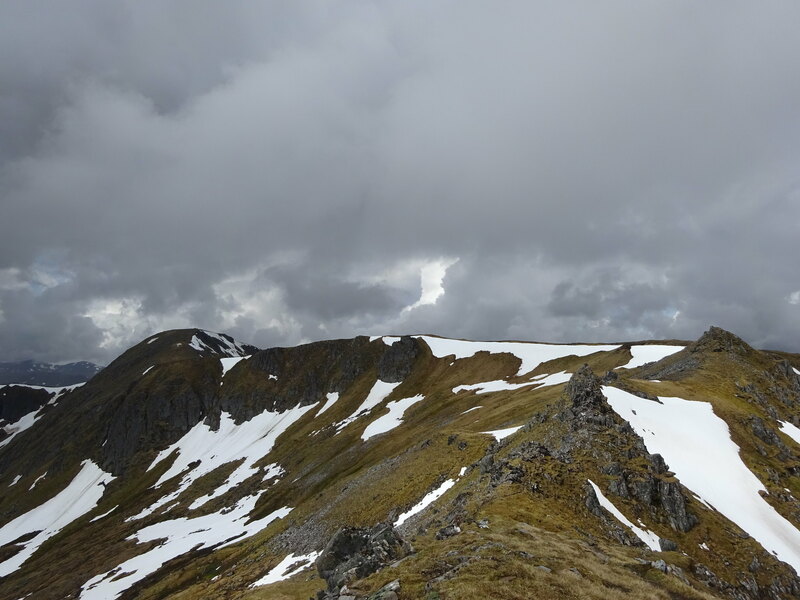 It was steep for sure with some snowy patches, but there were no difficulties and the ice axe, which I had brought just in case, was not needed. 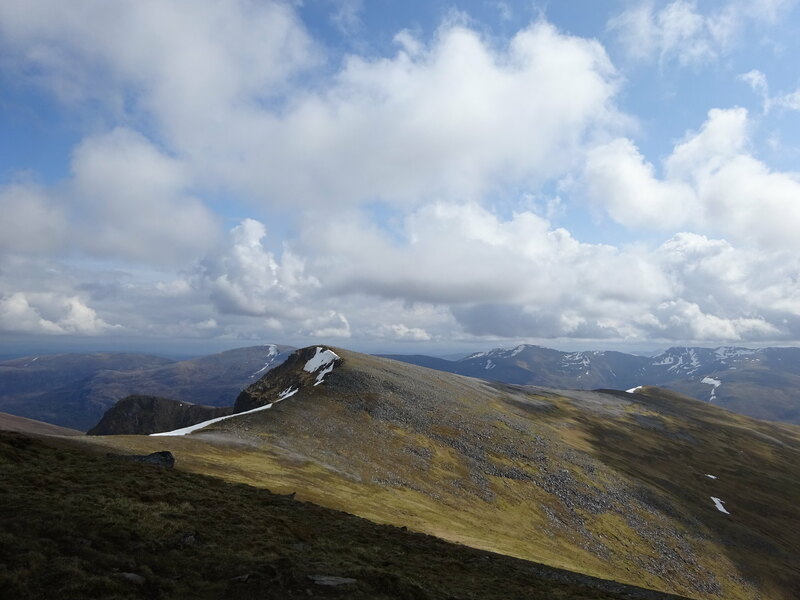 Just below the summit I met another walker. 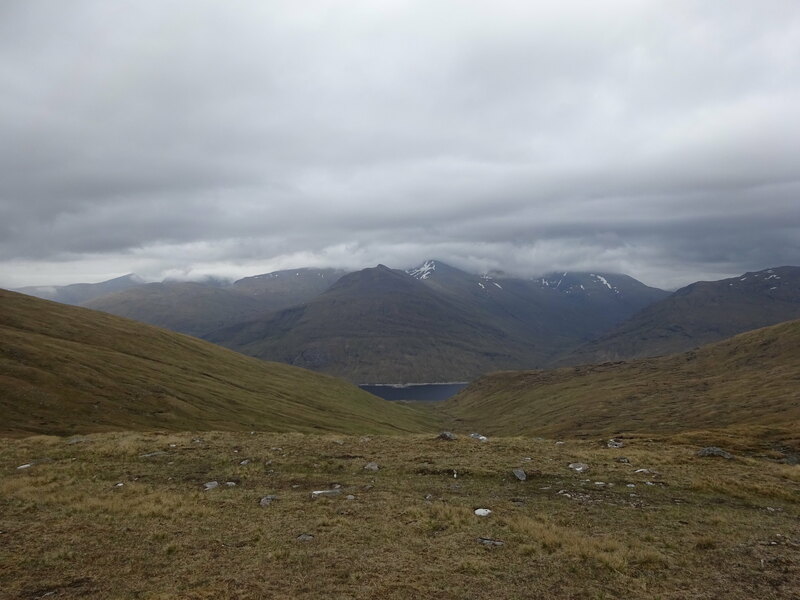 He had taken the ferry to the end of the loch and was doing the 4 northern munros clockwise. We had a short chat and I asked him whether he would mind taking the gilet I had found and leave it at an obvious spot in the car park, to which he kindly agreed. I wasn't going to catch up the person in front of me anymore and that was assuming they were also doing the whole round. 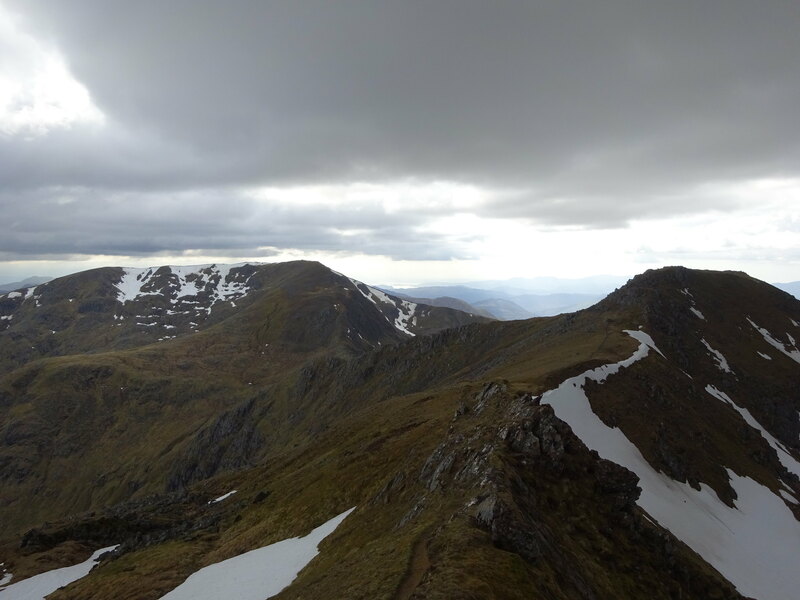 The final stretch involved some clambering over boulders and there was the summit. 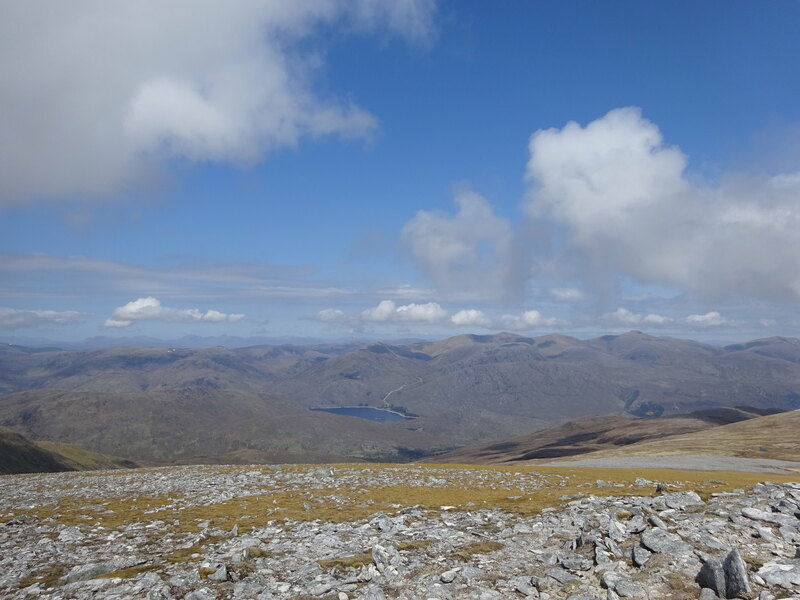 I found the going much easier after Sgurr na Lapaich, despite the downs and ups before An Riabhachan. 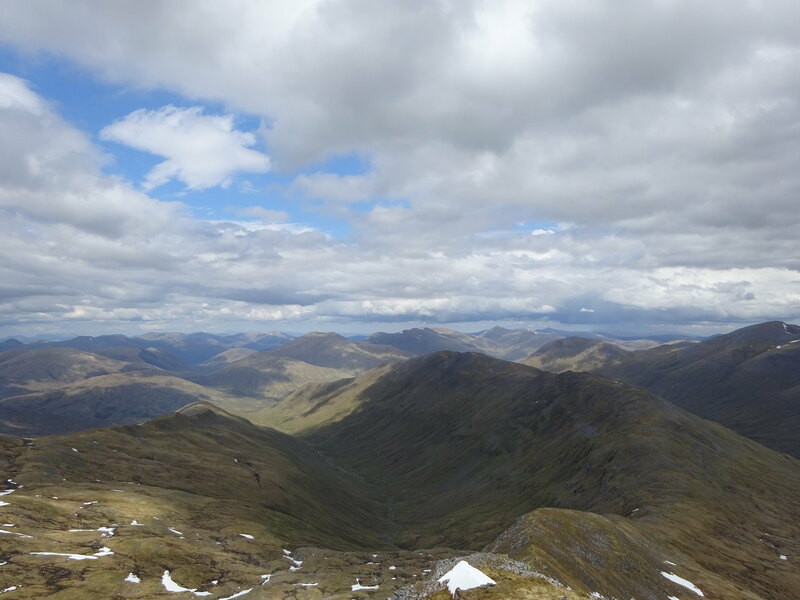 After 2 munros, I had found my mountain legs and rhythm. I was enjoying the views, the weather and just being out there . 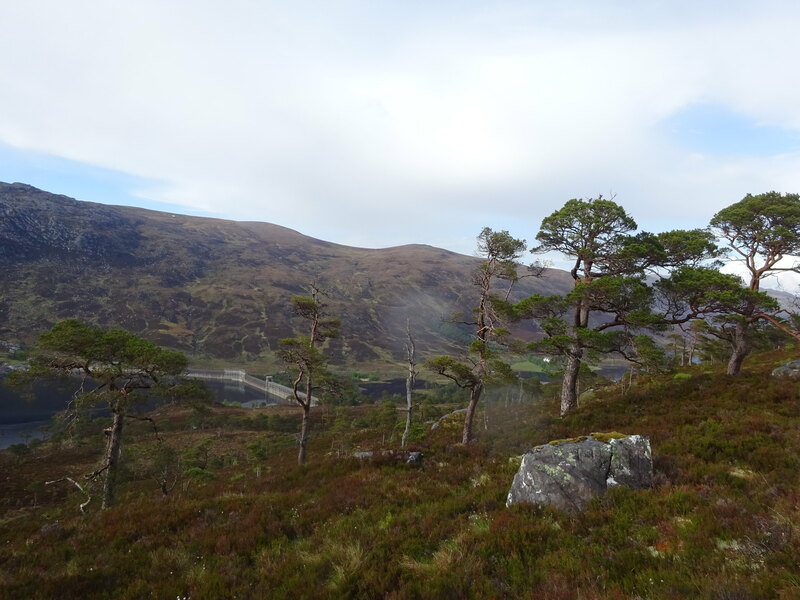 Once past Creagan Toll an Lochain it was freewheeling along the almost level ridge to An Riabhachan. A bit more effort was required to get to An Socach. 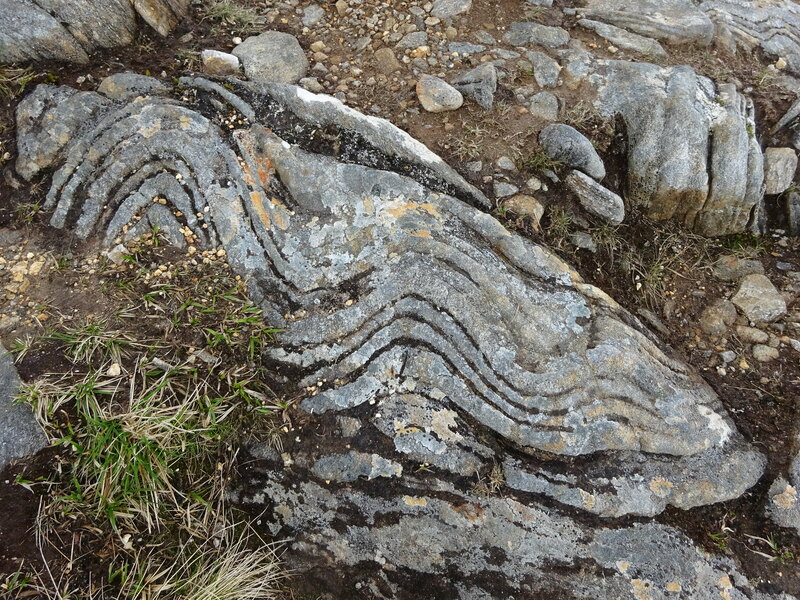 Still, the ridges were very nice. Dark clouds had been brooding in the east for a while and now the weather was definitely changing. A light drizzle turned into rain. A quick stop to put on waterproofs. Luckily there was not much ascent left to An Socach, so it wasn't too sweaty an affair. 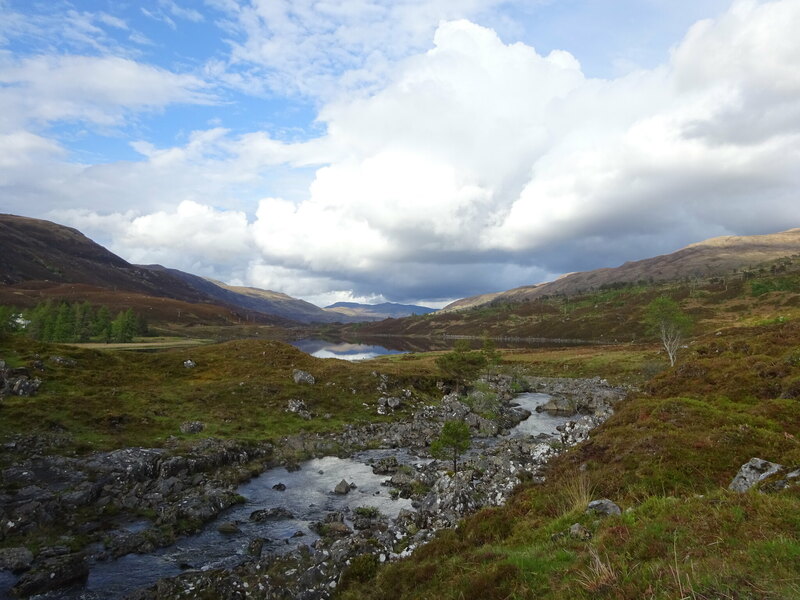 And now for the walk down to the loch, which was lovely. 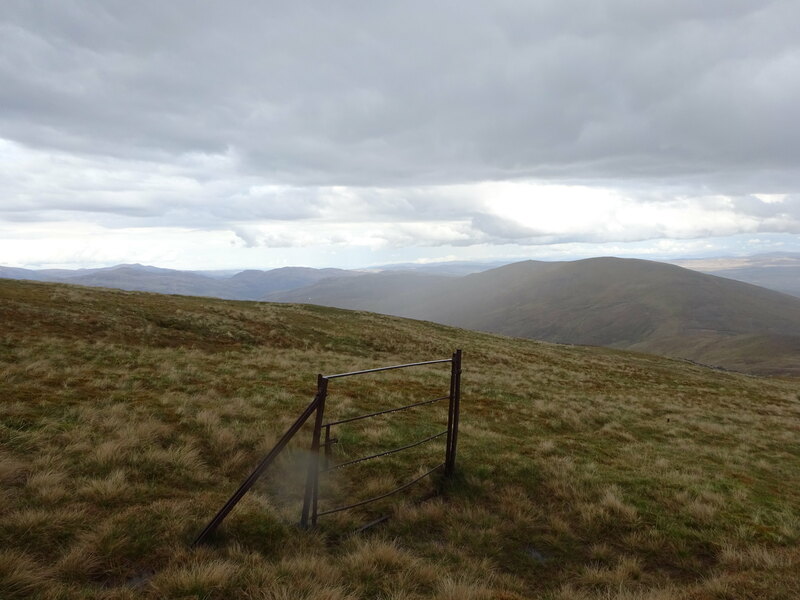 The slopes were mossy and soft, I saw a big herd of deer north of Meall Shuas, it was dry as the rain hadn't got any further than An Socach and most importantly there was no rush. No endless walk out and long car journey to fret about. Just arrive, pitch the tent, eat and relax. 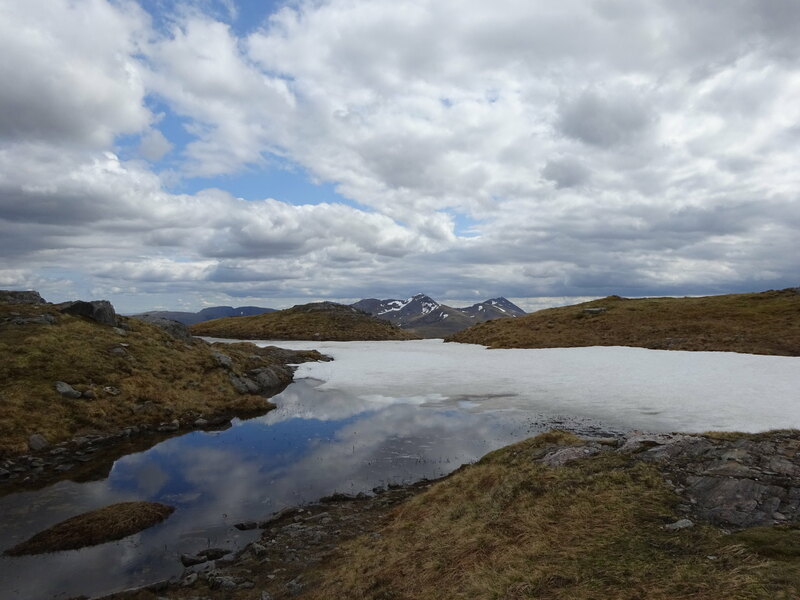 I aimed for the track parallel to the Allt na Criche, crossed the river at the ford and then followed it eastwards in search of a flat grassy patch for my tent. I found one at a polite distance from another tent. Its occupants must have been asleep, because I didn't see or hear them that evening. 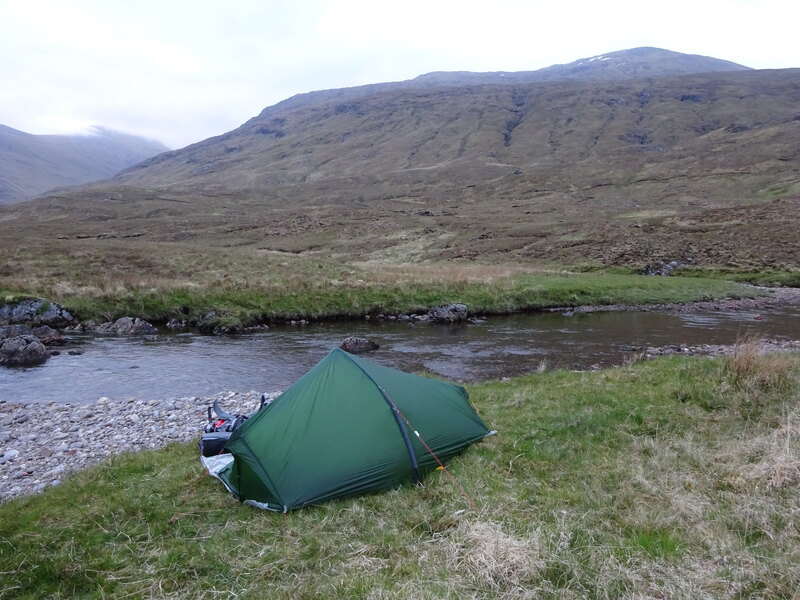 After food, lots of fluids and a refreshing dip in the river I pottered around a bit and then turned to the sleeping bag. I woke to a promising morning. 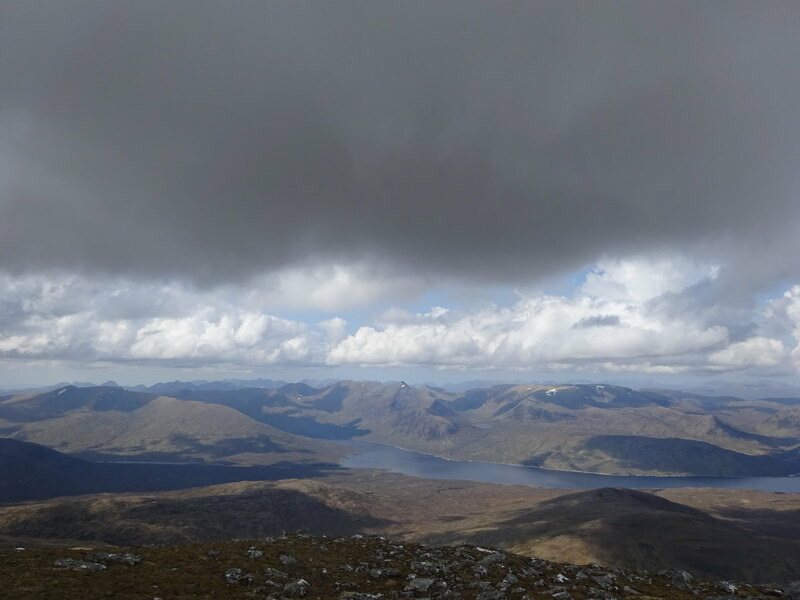 The sun was out and cloud was already disappearing from the hills. 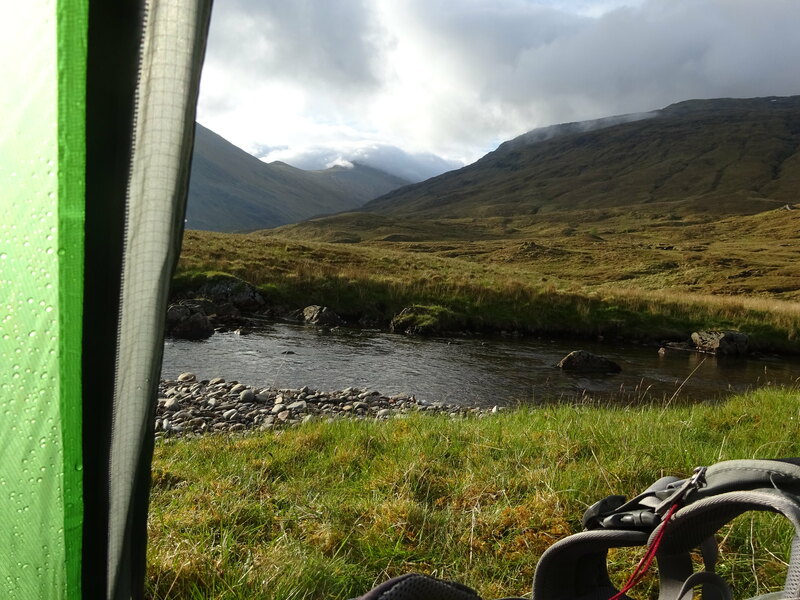 From the tent I could see my pitch for tonight, at the bealach just before Beinn Fhionnlaidh. Less than 4km away as the crow flies . Breakfast was the oatcakes-nutella combo and lots of water. Two whole litres of it! I knew water could be an issue for today and tomorrow. So best to hydrate whilst it was still in abundance. 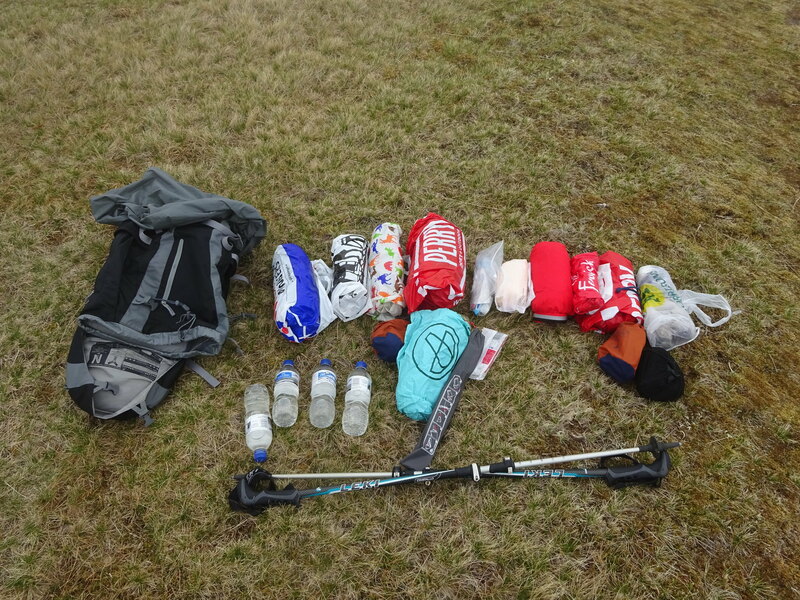 I filled my water bottles and a 1 litre bladder, with a view to top up again at the Allt Cam later on. The occupants of the other tent were now also up. 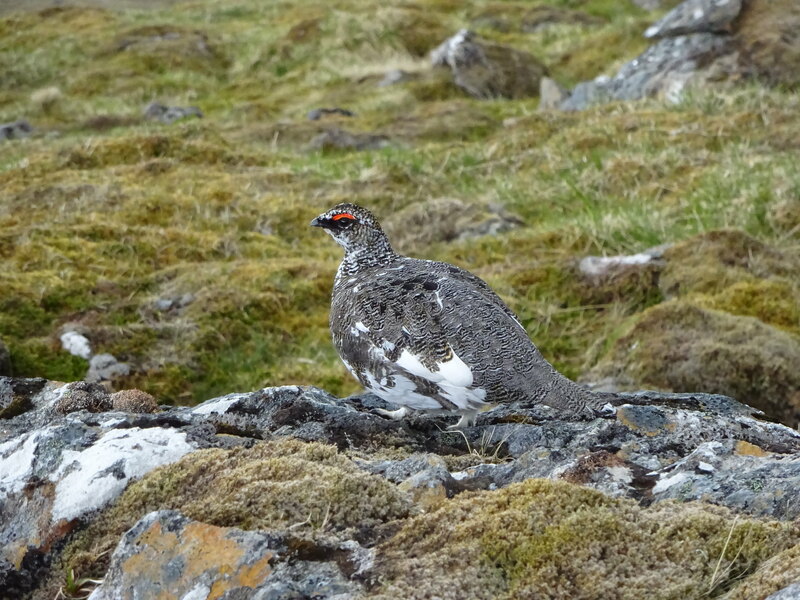 I had a chat with them when they passed my tent on their way to the hills. 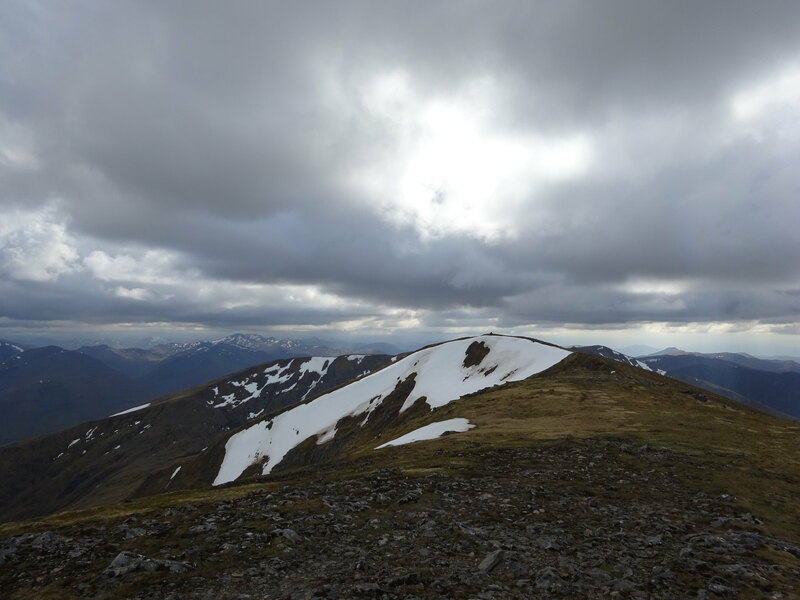 They were a father and teenage son who had been camping here for two nights, having come in by ferry, done the North Mullardoch hills, on their way to Beinn Fhionnlaidh today before being picked up by the ferryman again in the afternoon. The gilet was not theirs. 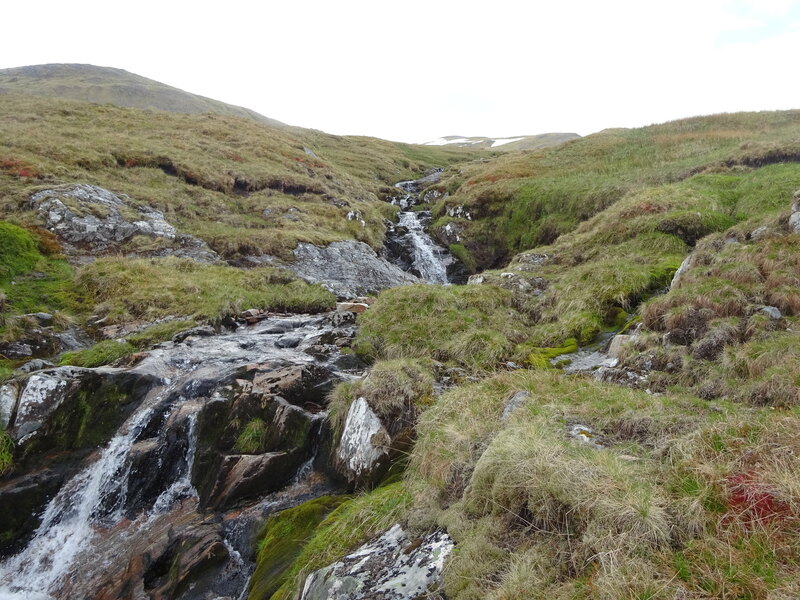 After having decamped, I followed the path eastwards for a while and then cut across to follow the Allt Cam. I was pleased to find a track alongside the river, it definitely made the ascent easier. 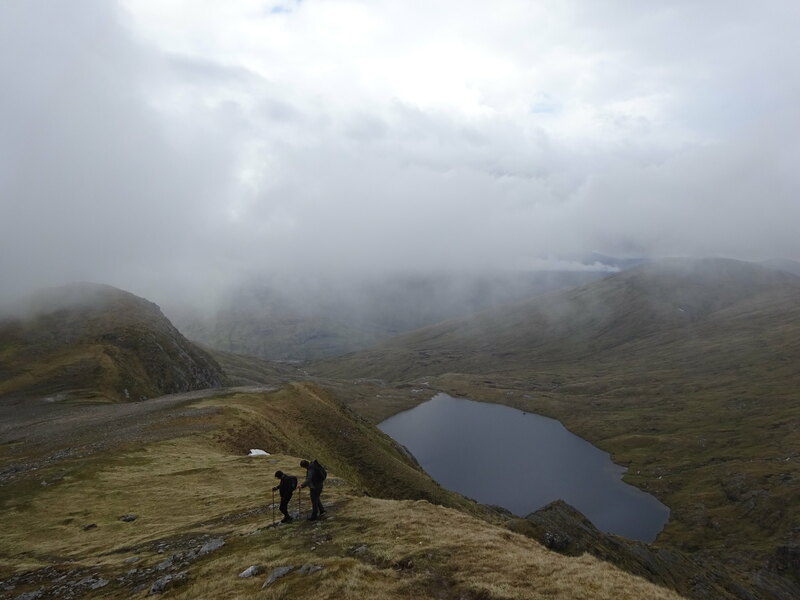 The views down to Loch Mullardoch were pretty amazing, as were the waterfalls. After having downed another half a litre of water, I topped up my bottles just above the last waterfall, where it is flatter and easier to get to the river. Two and a half litres of water in the system. That was it, from now on water was rationed! 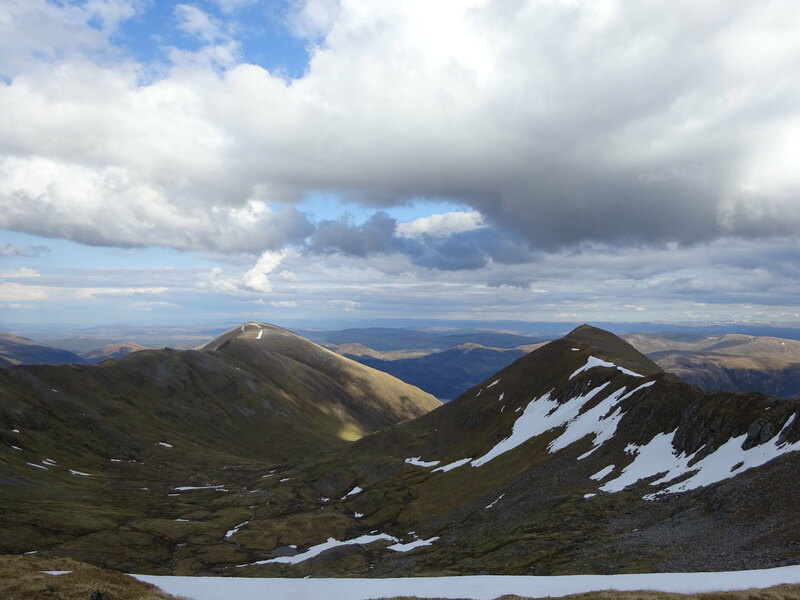 From there I headed for the ridge just past Creag a' Choir' Aird. There was an area of peat bog to cross, but luckily it was mostly dry. 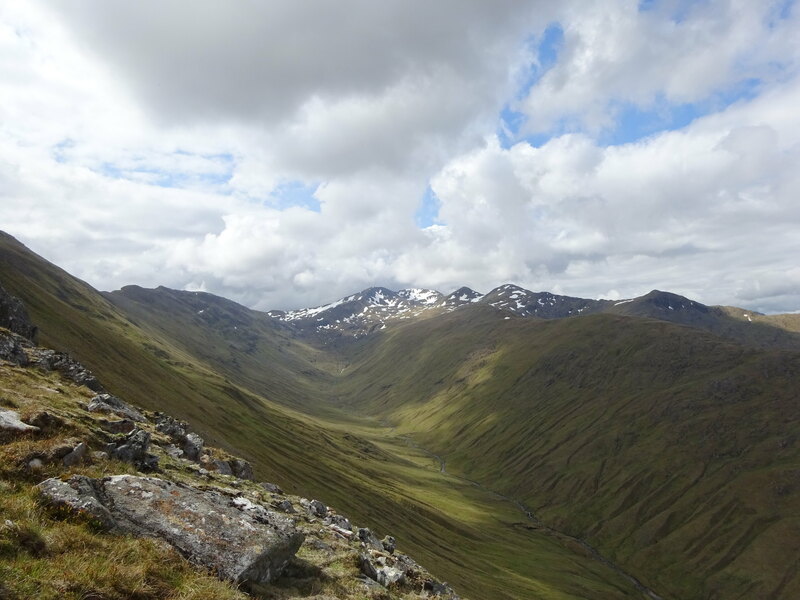 The views from the ridge were fabulous, especially along Gleann Sithidh. Those sweeping flanks! 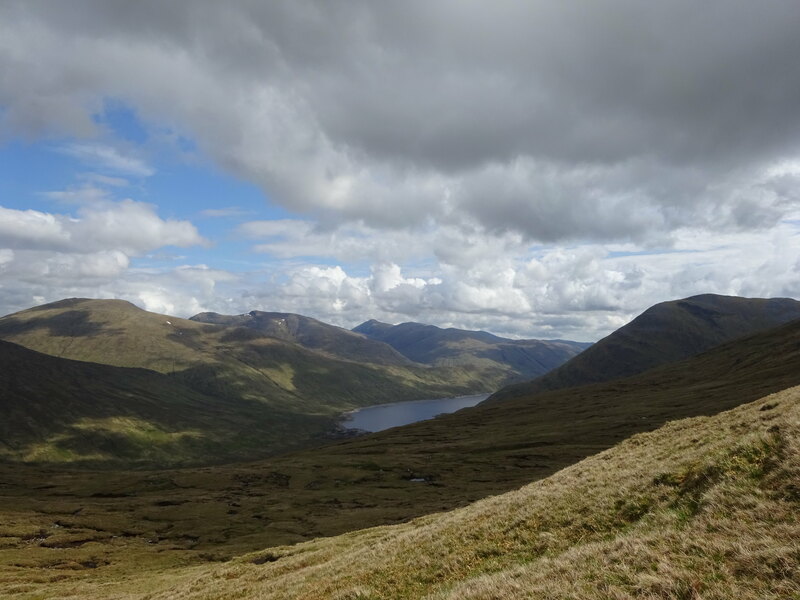 On the ridge looking back across the peat bog to Loch Mullardoch. 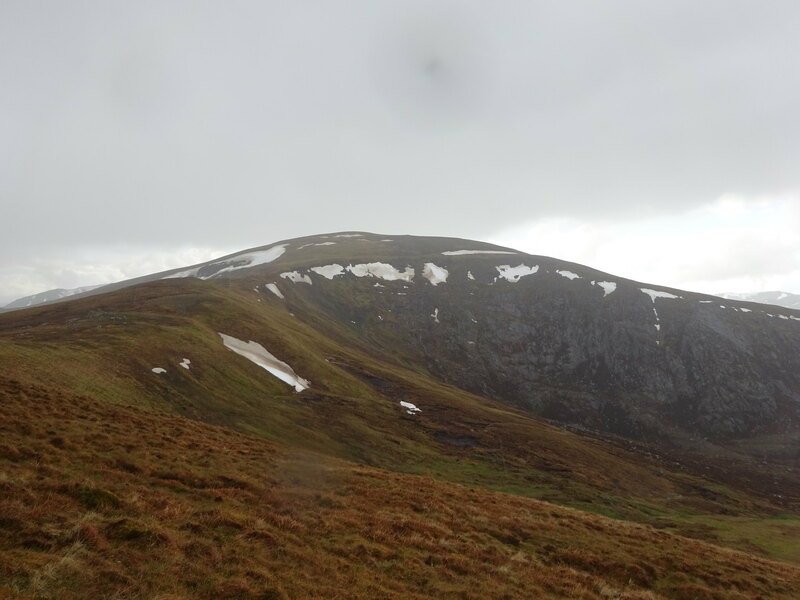 There was a path on the ridge, which I followed up Mullach na Dheiragain. 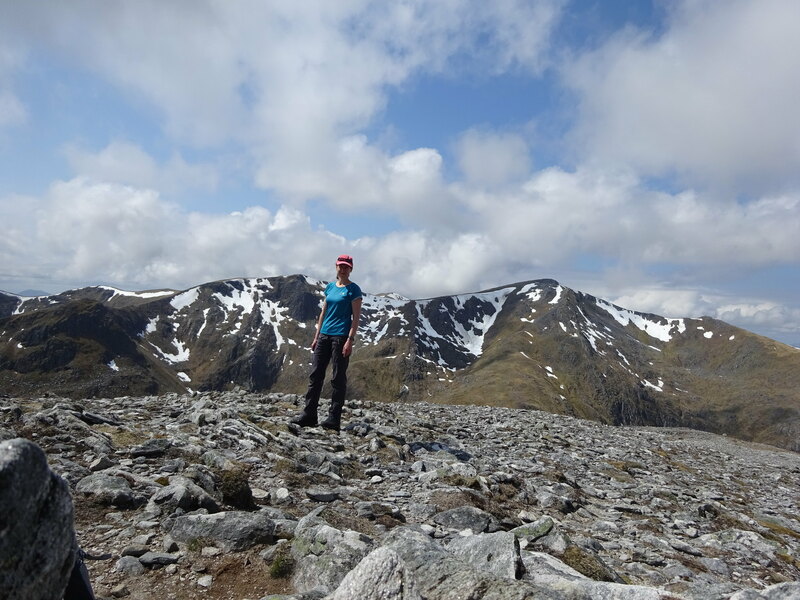 On Mullach Sithidh, nearly there! 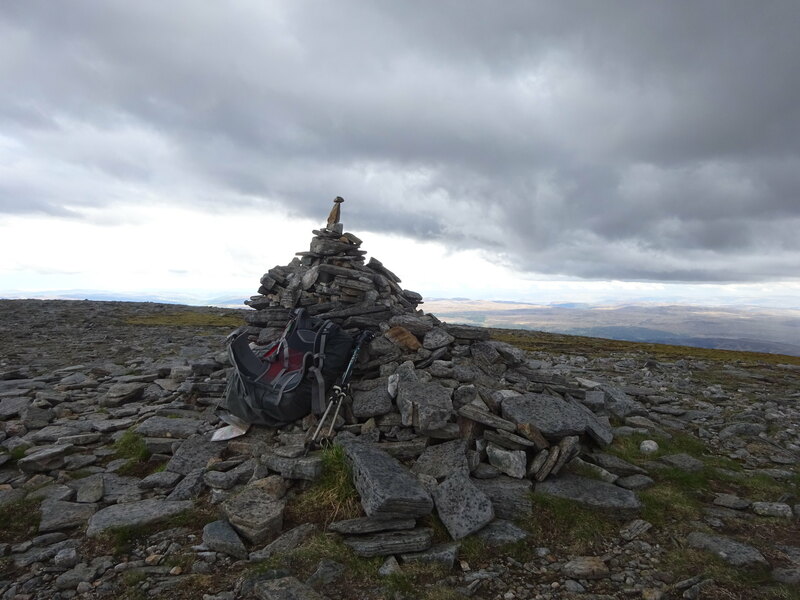 Considering the remoteness of this area, it was a bit of a surprise to see 6 people on the summit! We exchanged hellos, but for the rest everybody was quite happy to sit in silence, soak up the views and enjoy being in such an amazing place . On the way to Sgurr nan Ceathreamhnan I had a chat with most of them, as they passed me. 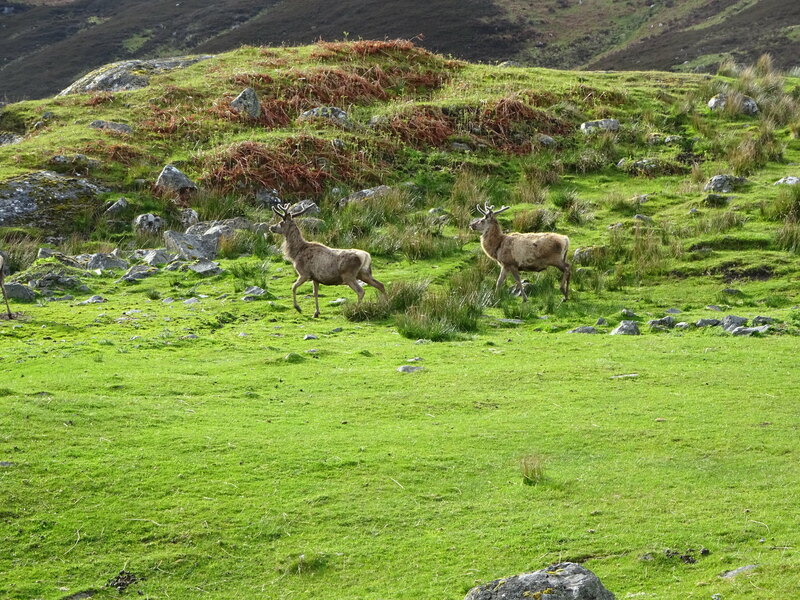 They were much faster and were virtually skipping along the ridge, whilst I toiled with my full pack. 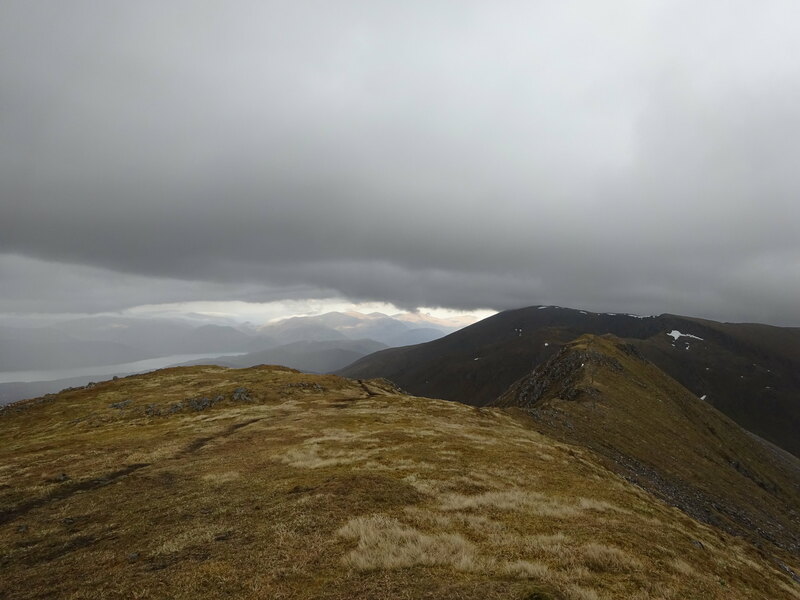 At long last there was Sgurr nan Ceathreamhnan! 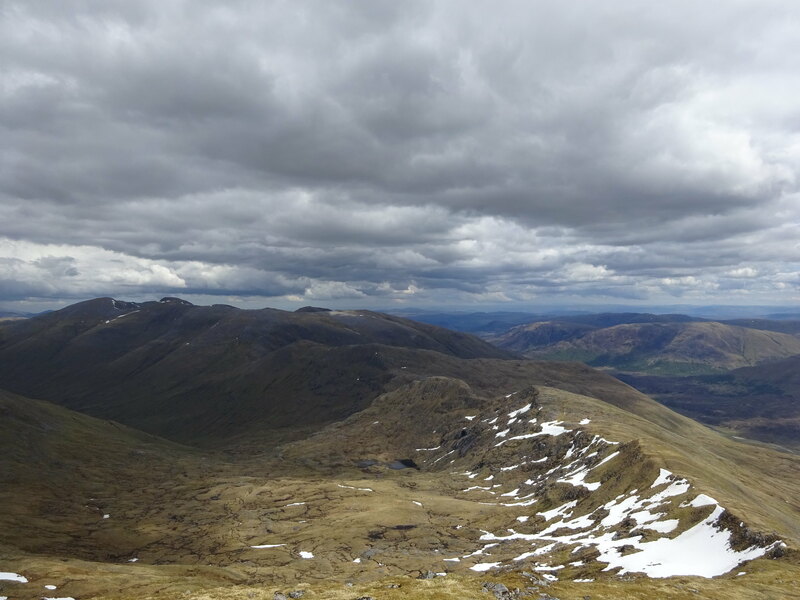 That the walk ahead would be long was quite obvious from here! The continuation to An Socach was fine. 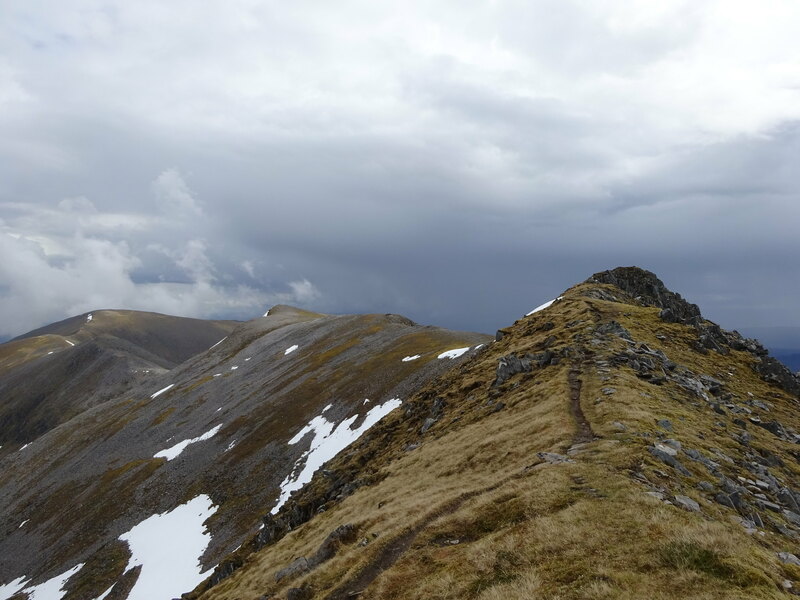 Not too steep, just a few bumps with the bonus of a strategically placed water/ snow feature on the ridge. An Socach was the last hill for the other walkers. They gave me some of their water, which was really kind, thanks guys! 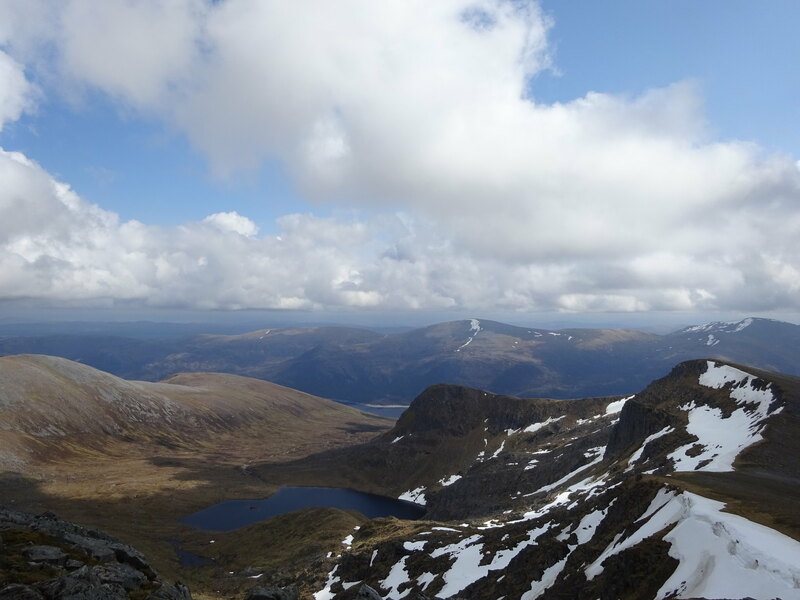 A leisurely walk to An Socach's North East top and then down to Bealach Coire Ghaidheil. 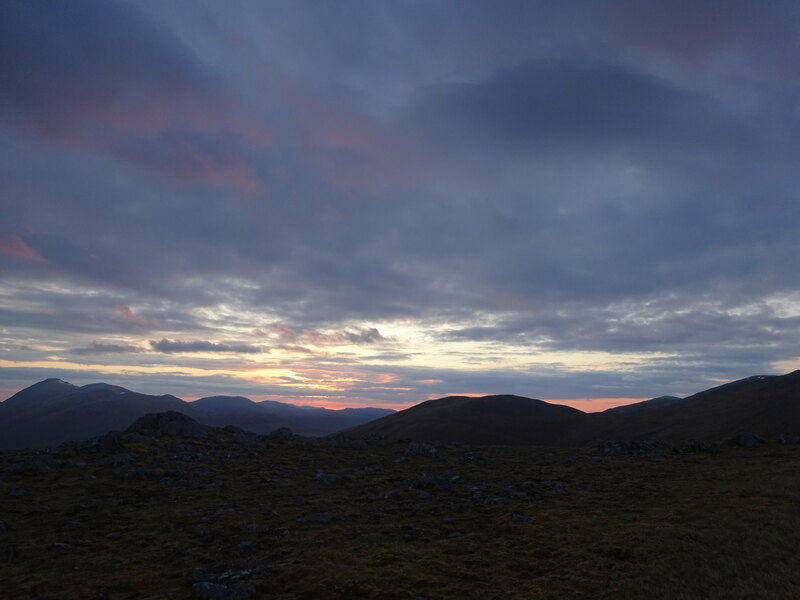 It was a lovely evening and I felt very contented and lucky to be in this wonderful remote place . 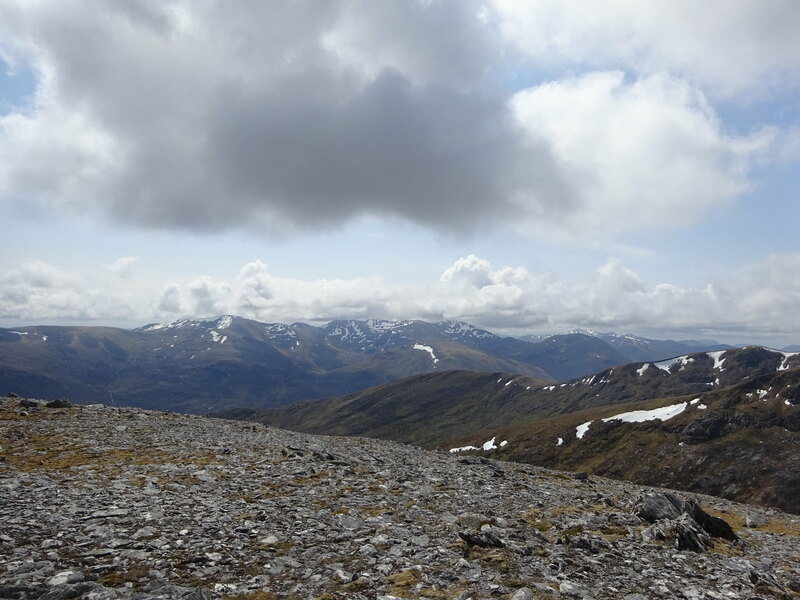 From the bealach I picked up the path that climbs up the flanks of Mam Sodhail. As per the map, the path indeed stops just as you go round the bend into the corrie. 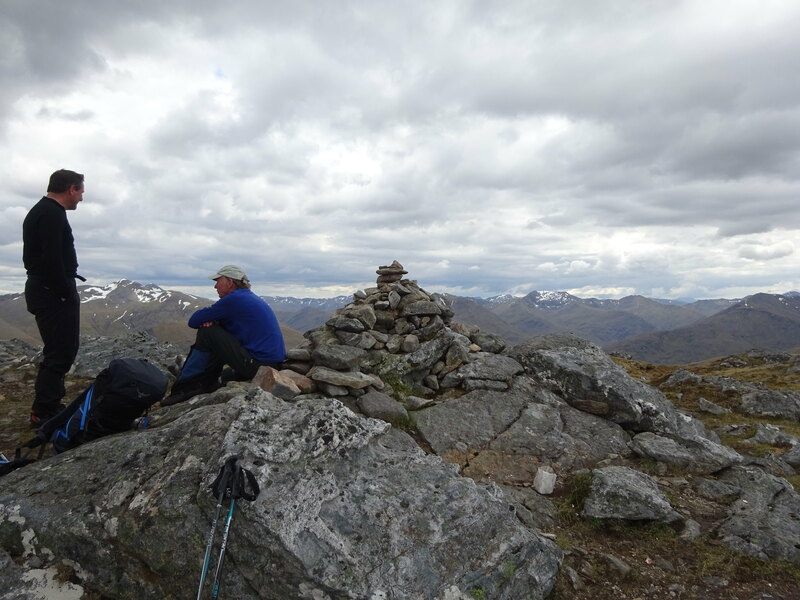 A short while later I arrived at the summit of Mam Sodhail. 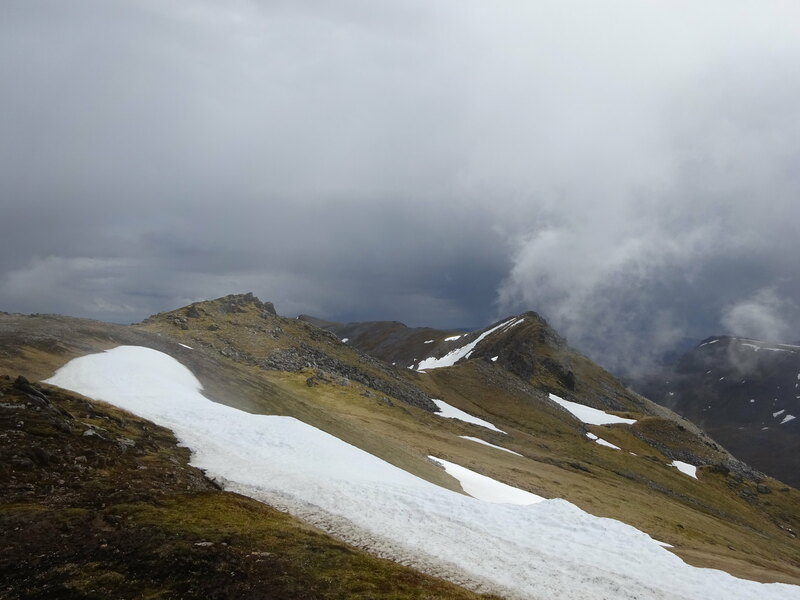 There were some distant rumbles of thunder and after having eyed up Carn Eige, I decided to bypass it and from the bealach head straight for my wild camp spot at Bealach Beag. 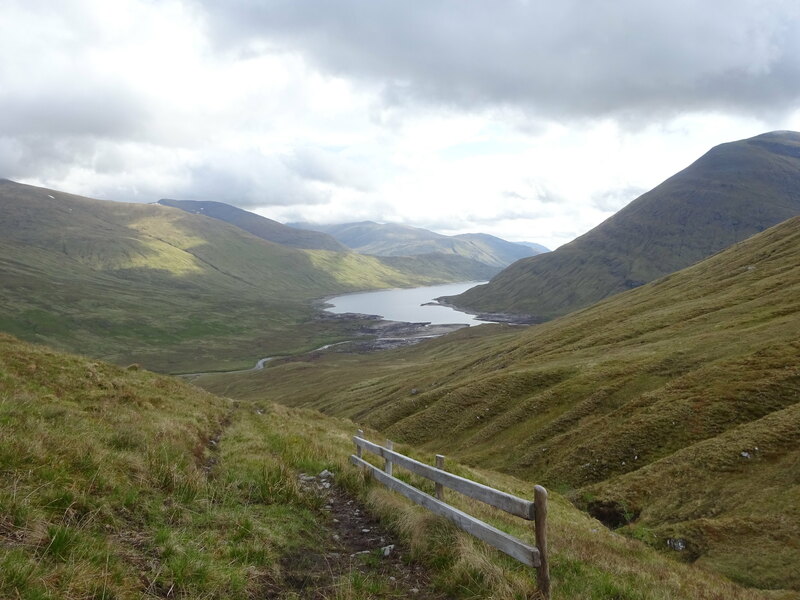 I stumbled across a path after a short while, but it went too much downhill for my liking and I didn't want to end up at the bottom of the glen. Not sure whether it was the bypass path (turned out it was), I made my own traverse, across some unpleasantly loose bouldery sections. Not the best route but I managed. It seemed like a front was coming in from the North West. 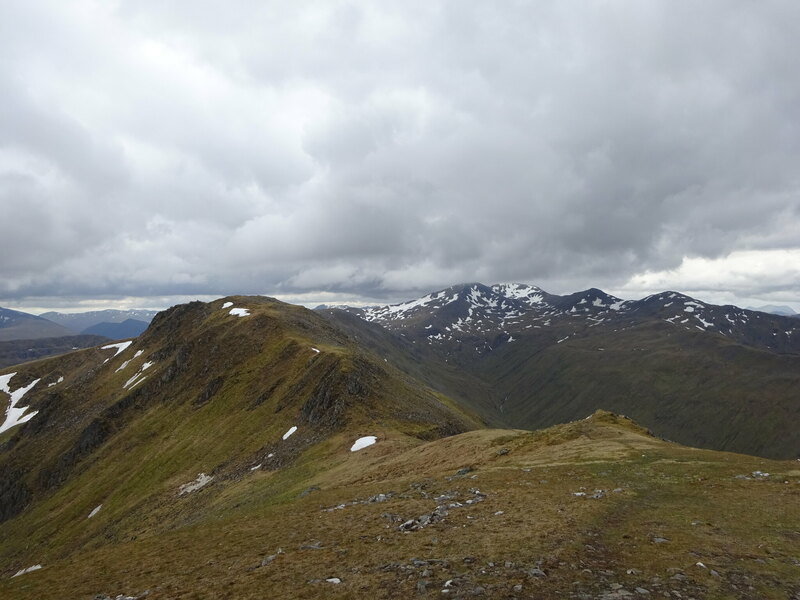 Initially I thought it wouldn't get as far as Beinn Fhionnlaidh, as there was an easterly wind. 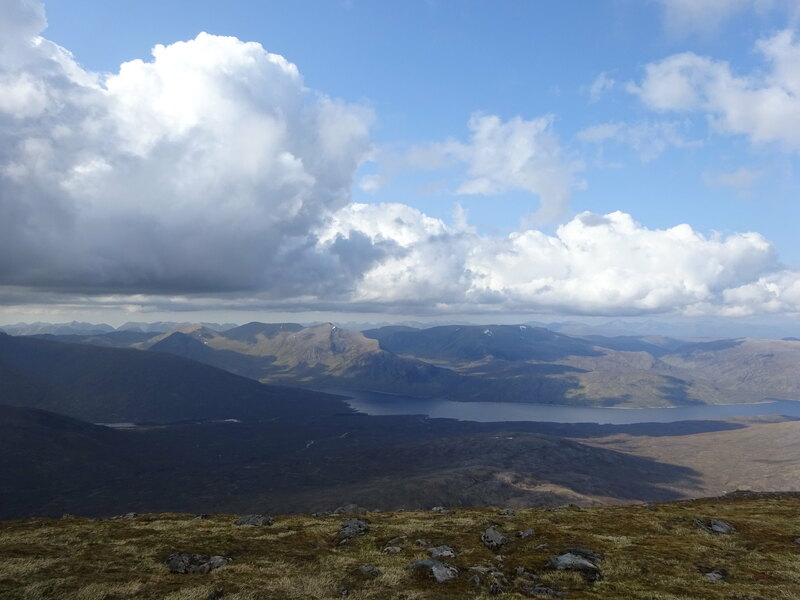 But once at Bealach Beag, it was a definite northwesterly and the cloud rolled in quickly. 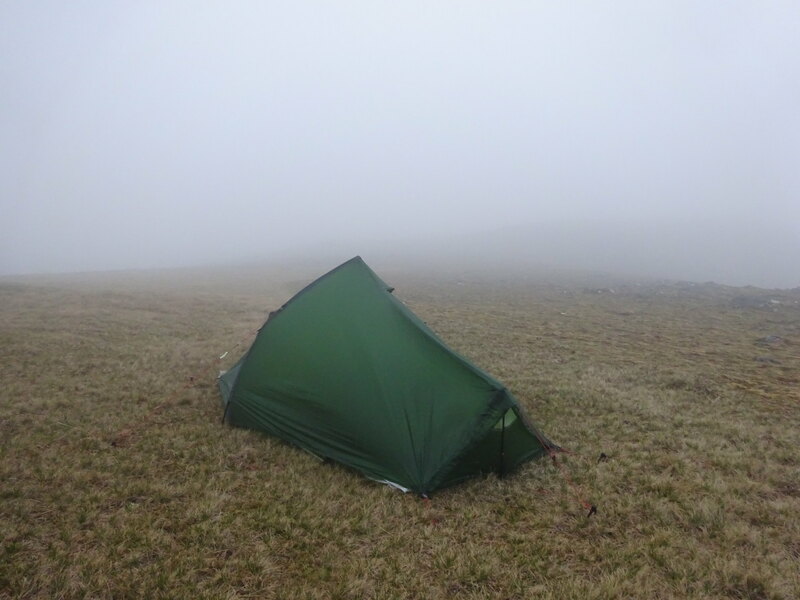 I managed to pitch the tent just before it started to rain. Yes! Tent with Beinn Fhionnlaidh in the background, honestly! A grey start. 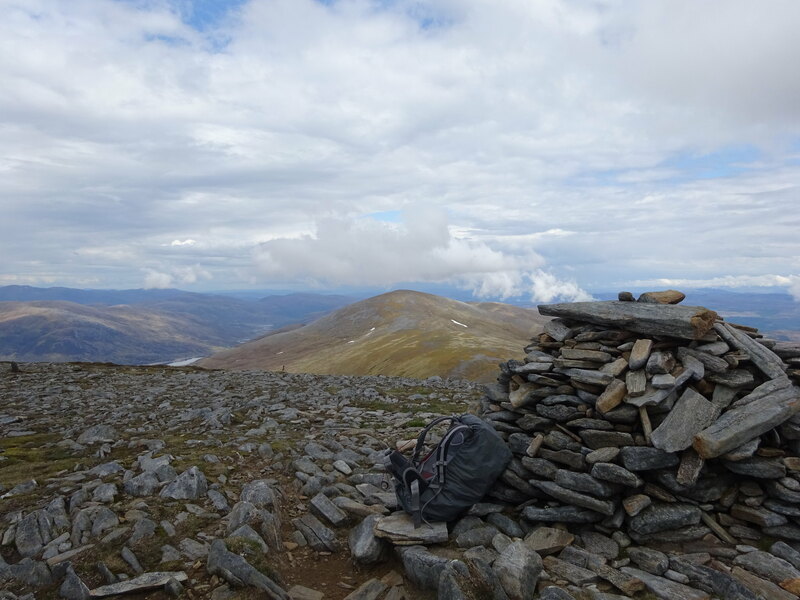 I left my rucksack just before the ascent at a big rock next to the path. 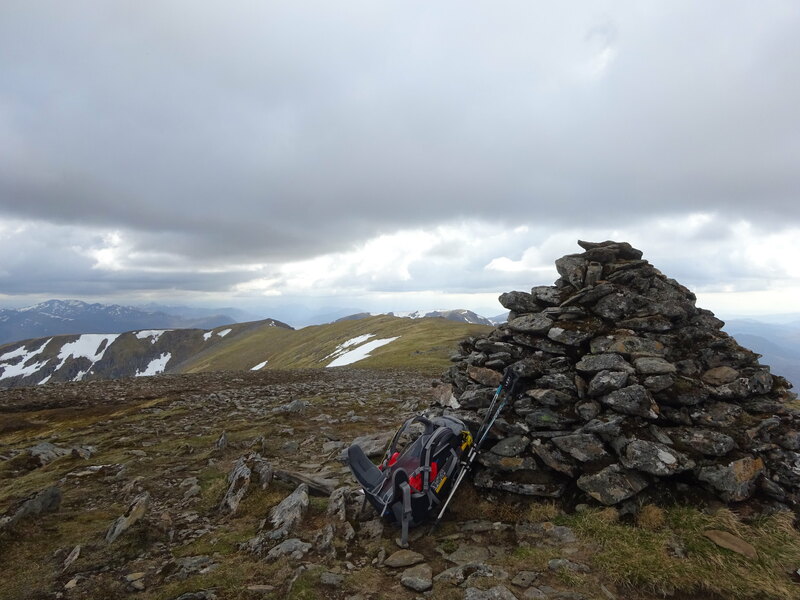 It was great to walk without the load and soon I got to the summit of Beinn Fhionnlaidh. Once down again I met two walkers. They had camped on Carn Eige. We chatted about last night's thunder and how the cloud had rolled in ever so dramatically. I found my rucksack exactly where I had left it. With its grey rain cover, it might as well have been a boulder! 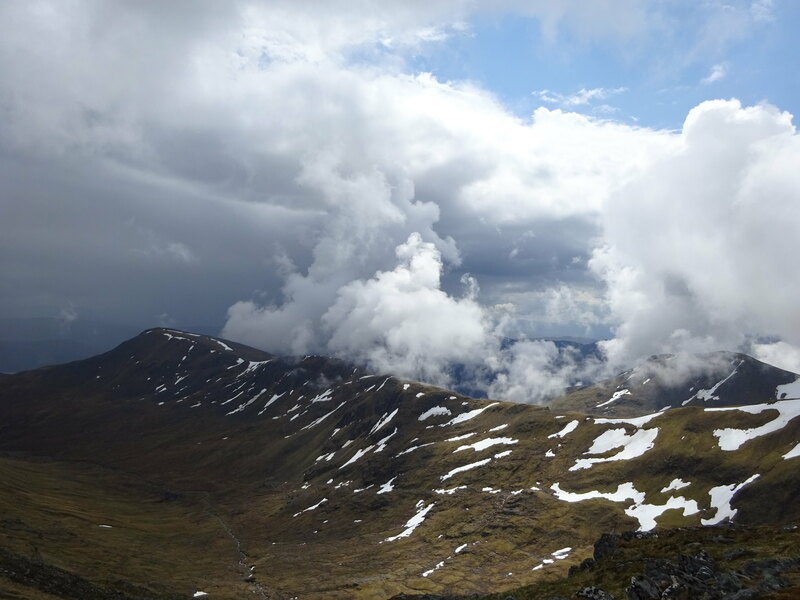 On the way to Carn Eige it started brightening up. 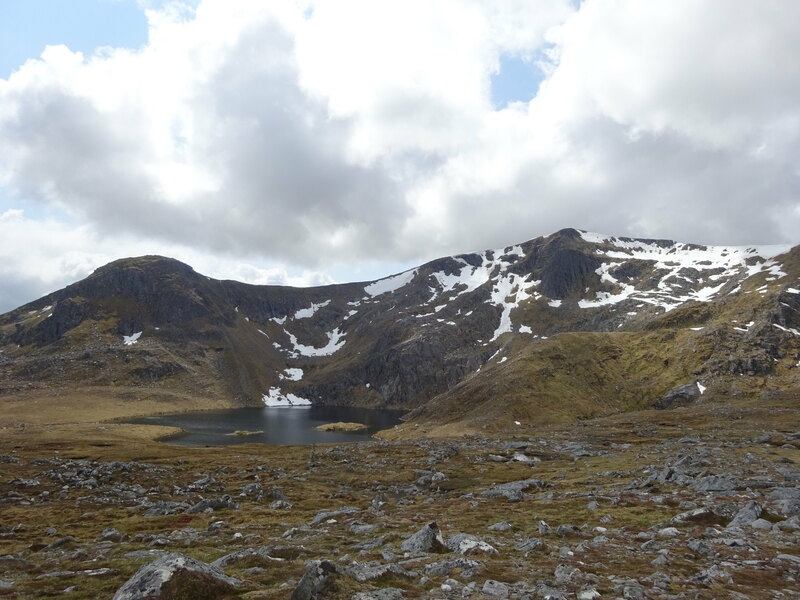 Coire Lochan was slowly emerging and by the time I had finished chatting with two other walkers on their way down from Carn Eige, it was completely visible. 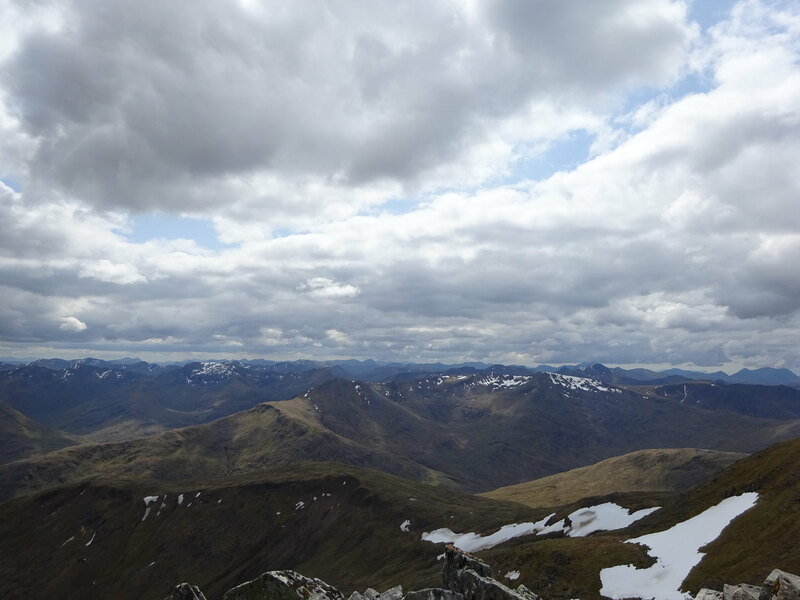 A bit further up there were proper views again. It was a rocky ascent, but no scrambling involved. I met another three walkers on their way down. A busy morning! 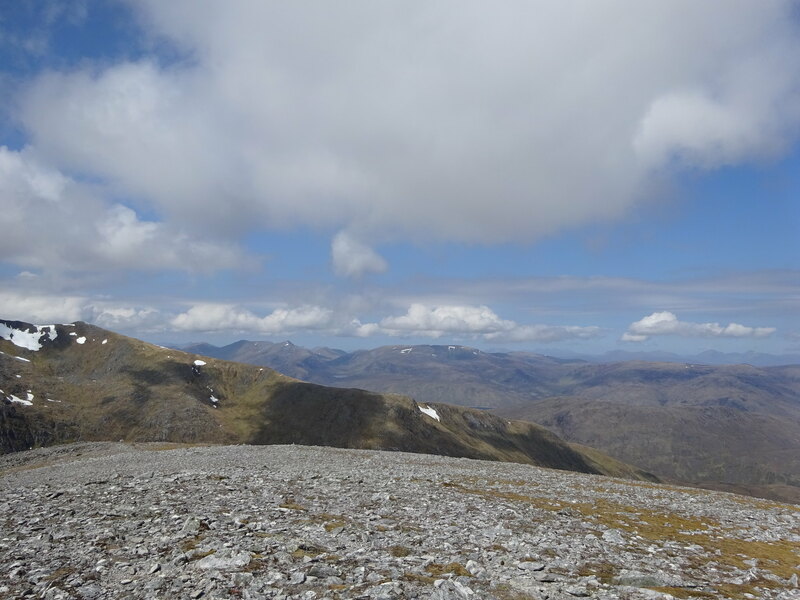 On Carn Eige I did a little jig (luckily witnessed by nobody) as it was my 200th munro. I celebrated with a swig of water and oatcakes with extra nutella. Really pushing the boat out here, I know! The weather was wonderful. 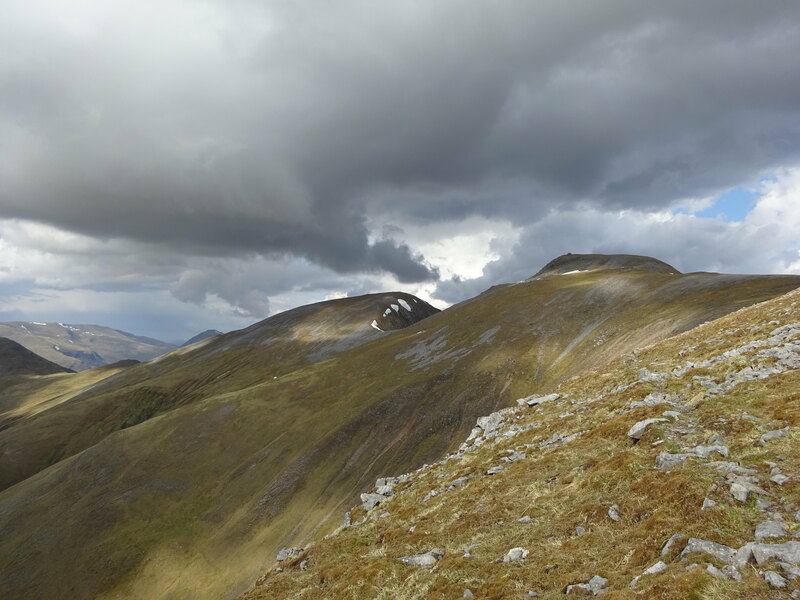 From here to Tom a' Choinich it provided a magical show of wispy cloud moving in and out, brooding skies, blue skies, blazing sunshine and a bit of light rain here and there. It was amazing to watch. 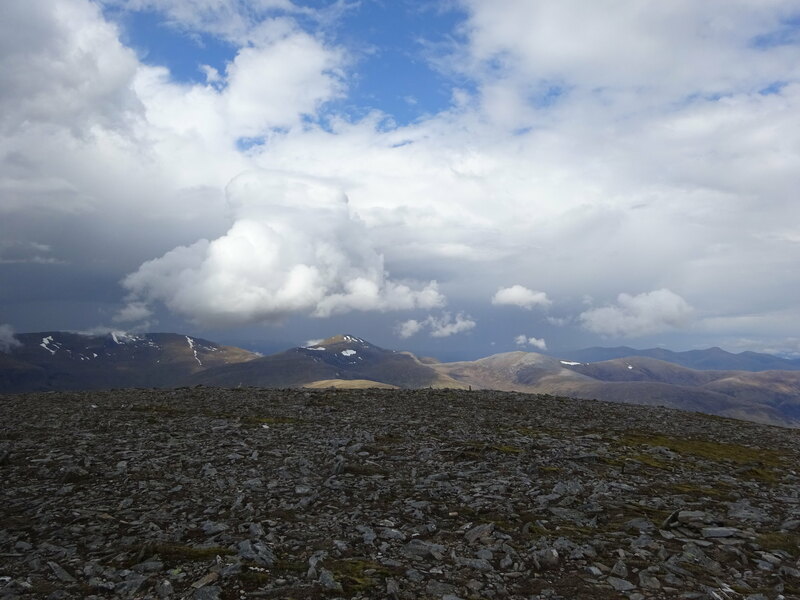 When I left Carn Eige it was sunny so I got the sunglasses out, which promptly triggered some rain! 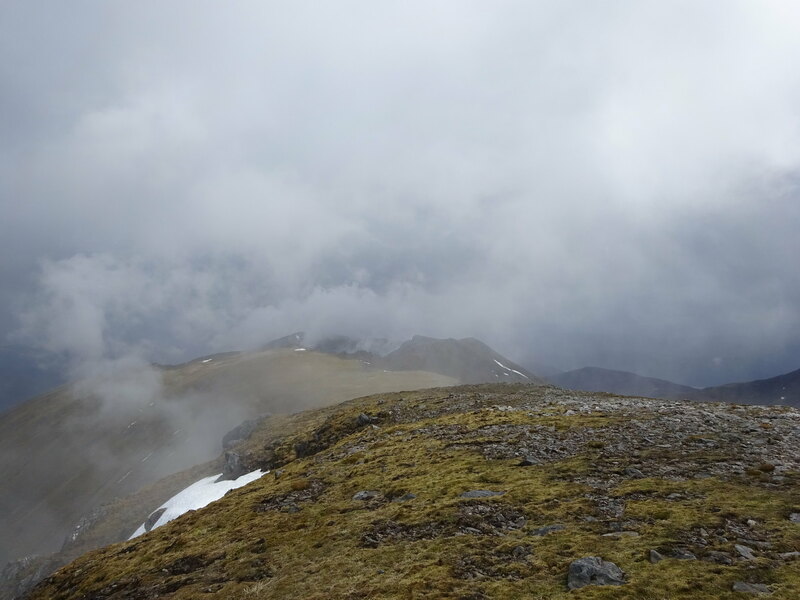 On the way to Stob a' Choire Domhain I met another walker. Whilst chatting I discovered that I had lost my sunglasses. Hmm, I still had them on Carn Eige. I said to the walker that if he found them, he could keep them or give them to someone else. No use them littering the hills. We chatted for a bit longer and then went our own ways. Still very much enjoying the weather display. 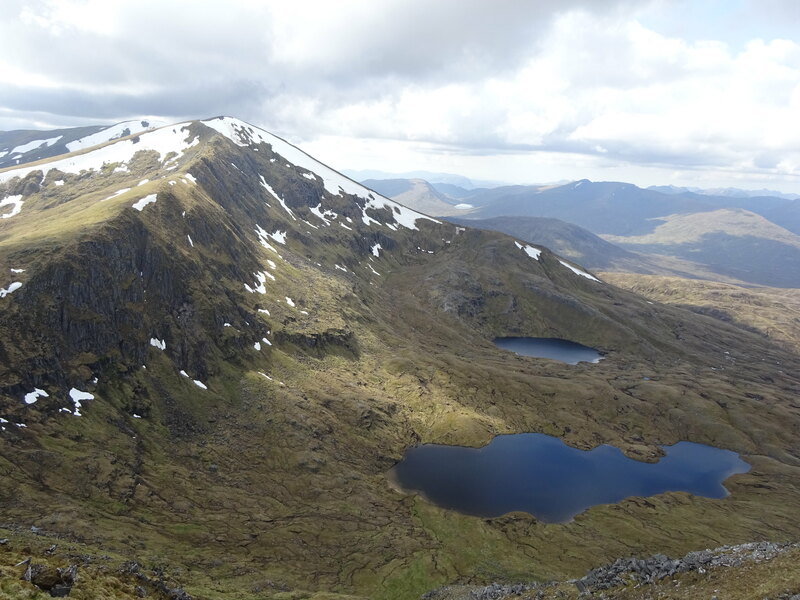 View to the north: Carn nan Gobhar, Sgurr na Lapaich and part of the An Riabhachan ridge. 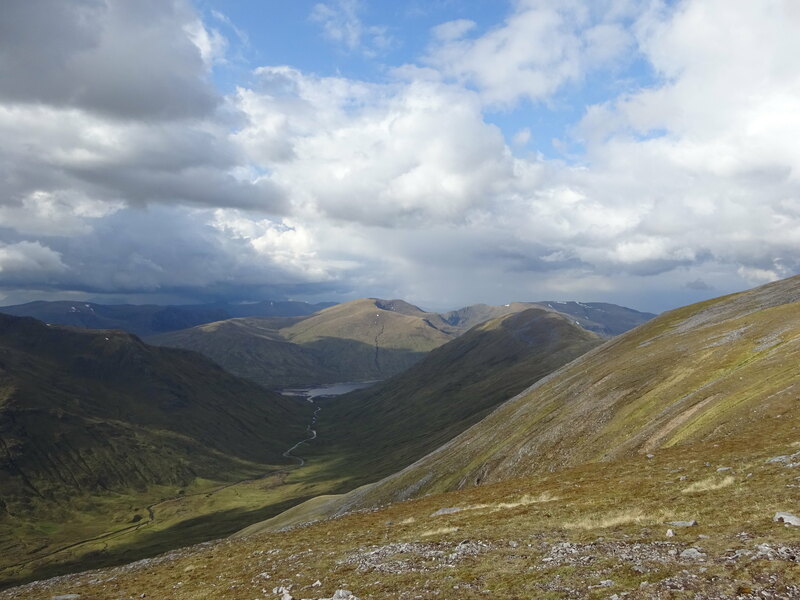 The descent from Tom a' Choinich was very steep, rocky and gravelly. Here I was caught up by another walker. He asked had I lost my sunglasses on Carn Eige and then produced my shades. No way! Many, many thanks! When he found them, the other walker was still around, who told him that I had lost them. What a coincidence! We chatted for a while longer. 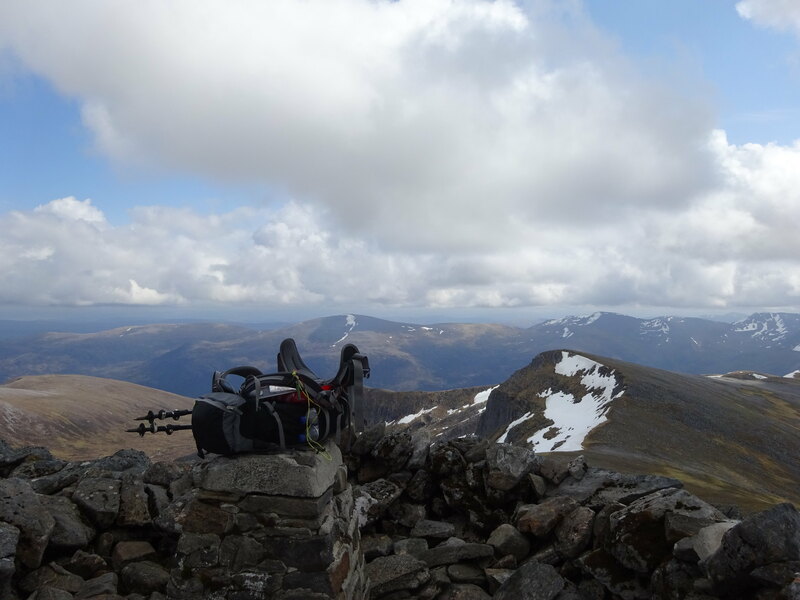 He was also doing the Mullardoch munros, but had started yesterday so was going round a bit quicker than me. 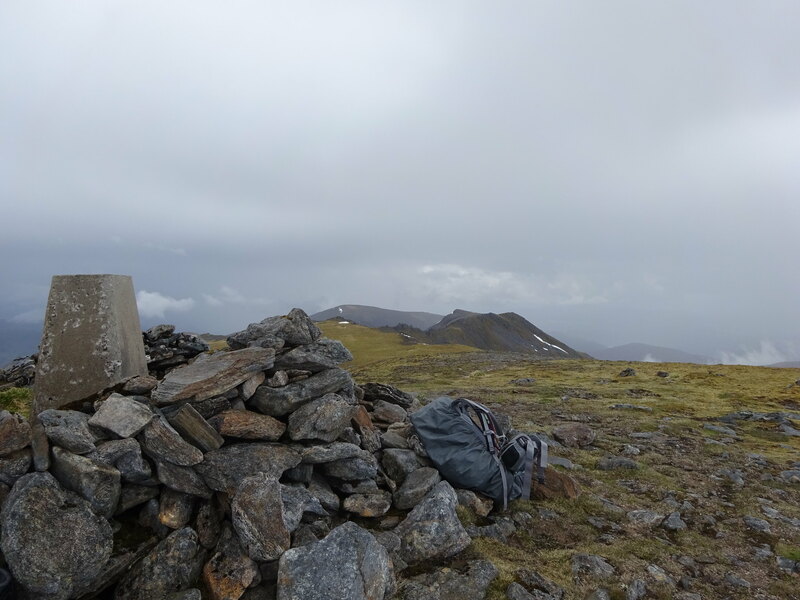 Once at Bealach Toll Easa the going got much easier. The cloud moving in now was of the rain bearing kind, so that was the end of the spectacle. I had read that Fraoch-choire is quite rough with a lot of heather. What's in a name. So I stuck to the higher ground for as long as possible and then headed for the gate in the deer fence. The dam looked very close by from here, but it wasn't as I was about to discover. 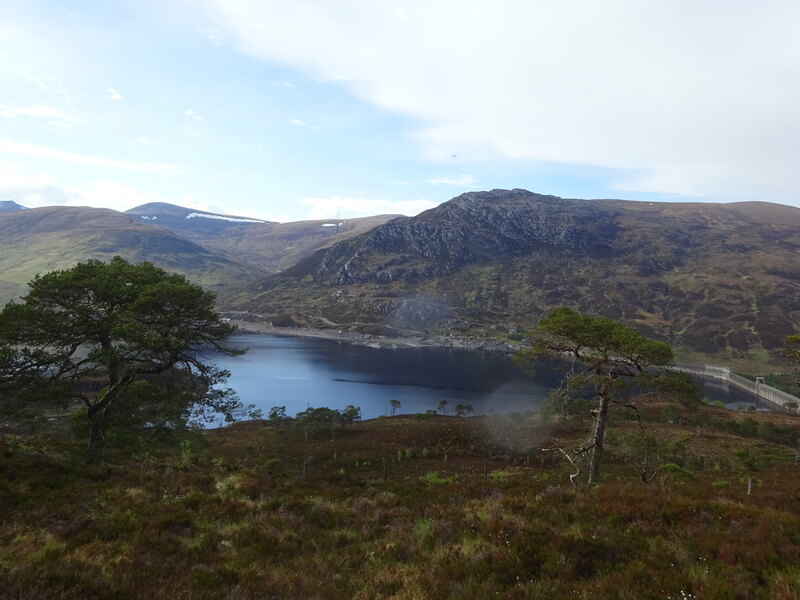 It all looked deceivingly beautiful: the sun was out again, Loch Mullardoch was very still, there were some very handsome Scots Pines around, the air was fresh and everything smelled lovely, like it does after rain and all the dust has been washed away. But the terrain was treacherous. Very rough ground, crags to be negotiated, heather obscuring holes and water courses, fallen trees to climb over. It seemed to go on and on. But I made it to the road unscathed. It really was a lovely evening and I didn't mind the walk back on tarmac at all. No sign of the gilet at the car park. Hopefully it got reunited with its owner. I really could relate to your water shortage. I had about 3 litres at the loch, and ran out with some 10km or so still to go; so I was reduce to sucking snow, which wasn't too effective! 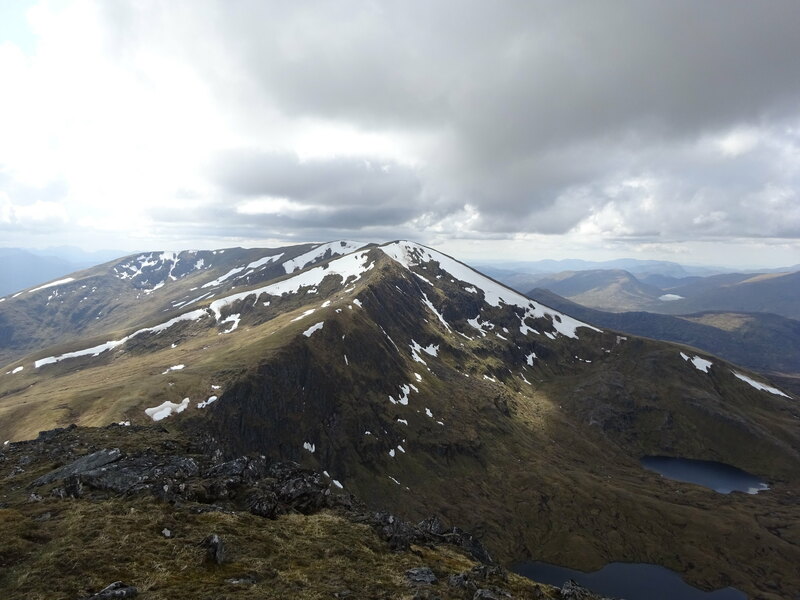 Talking to others, it seems ridge walkers always tend to take too much food, and not enough water. Great trip, enjoyed the read. 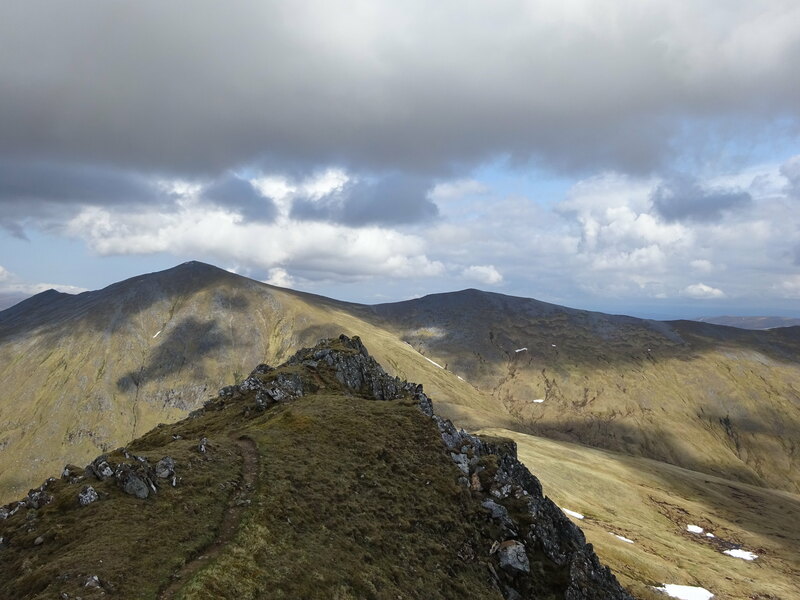 So that is what the Carn eige to Tom Creagach ridge looks like! Definitely on my repeat list. What a trip to get yours legs used ! Great start for this year !!! Really special to warm up ! Well done, looking forward to see your next adventures ! Brilliant way to reach 200 with some beautifully clear photos. I felt there was a kind of justice done when someone reunited you with your missing sun specs after you trying to find the owner of the gilet! 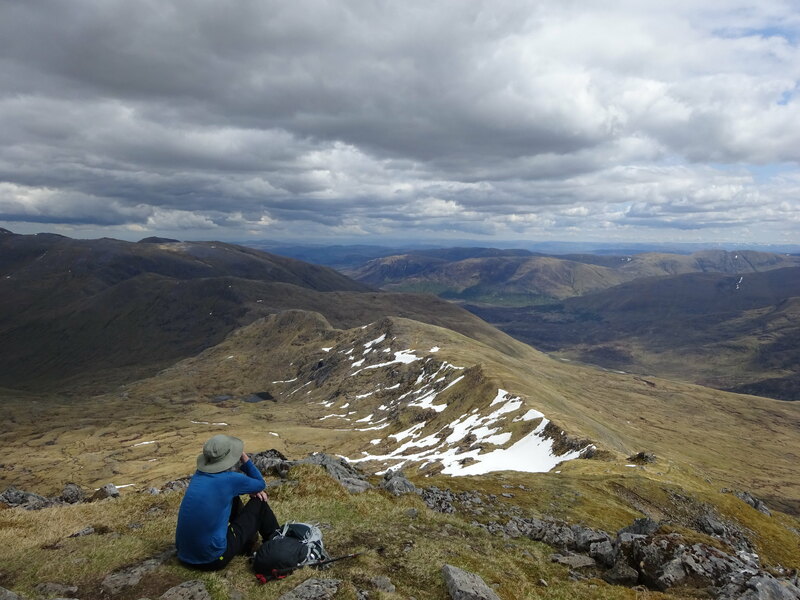 Backpacking, especially alone, is surely the finest way to experience the hills, since you're not just walking them for a few hours; you're completely immersed in them day and night. The feeling of contentment you describe says it all. I don't think I'd get away with a 35 litre sack though; you've obviously mastered the art of going light! Well done, Silverhill. That's very efficient, managing it all with a 32 litre pack. 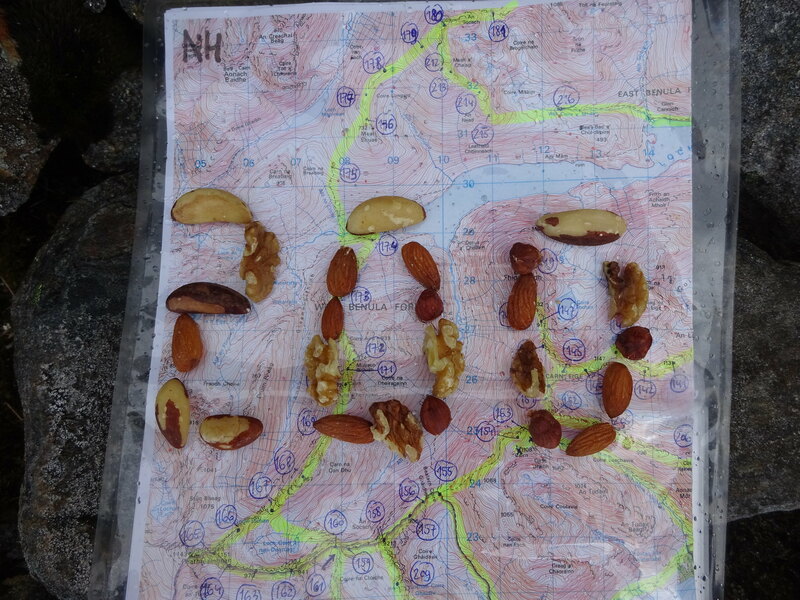 A great, wild area, and congratulations on the 200. Thank you ancancha! Very beautiful indeed, I have to return. The water shortage wasn't too bad. Of the 3 litres I started with, I had 2.5 litres left for the last day, thanks to the kind donation of the other walkers. Rationing water intake was quite humbling. We are so used to instant running water that we take it for granted. I hope you and your son get an opportunity soon . I would do it again tomorrow. Guinessman wrote: Great trip, enjoyed the read. 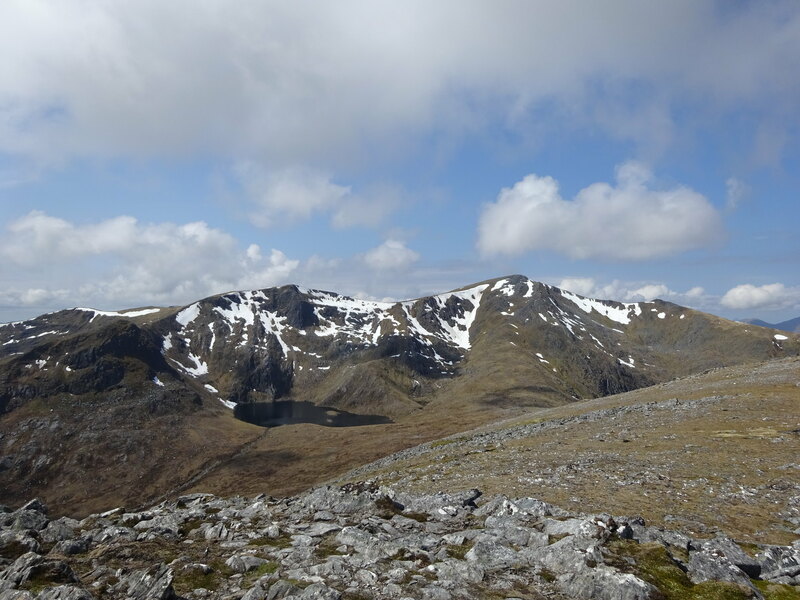 So that is what the Carn eige to Tom Creagach ridge looks like! Definitely on my repeat list. Thanks Guinessman! 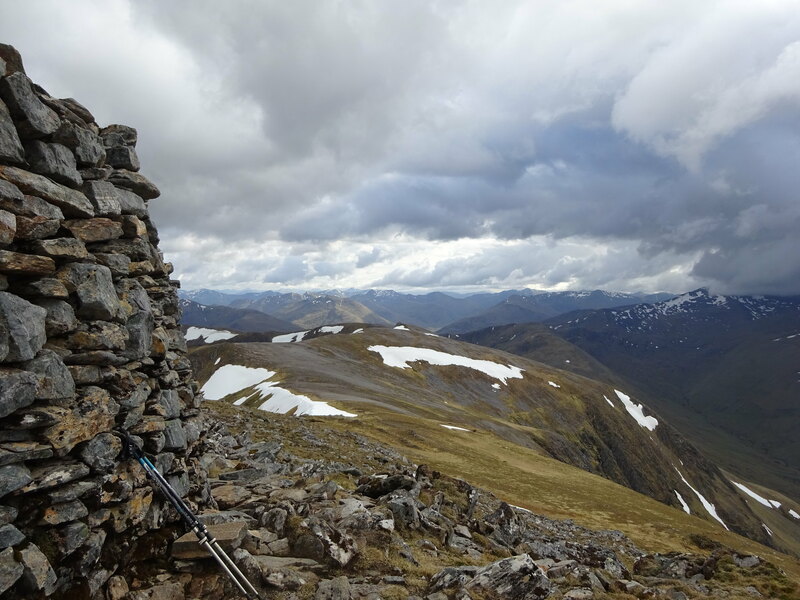 It is a lovely ridge but the experience is definitely enhanced when you have the views. It's on my repeat list too! Gordie12 wrote: Congrats on 200 Silverhill. You probably did more mileage than me, so I take my hat off to you. I'm just lazy! Petr Dakota wrote: What a trip to get yours legs used ! I didn't walk very fast, to give my legs half a chance of surviving another 7 days of bagging. It was a good holiday for pictures with clouds! dogplodder wrote: Brilliant way to reach 200 with some beautifully clear photos. I felt there was a kind of justice done when someone reunited you with your missing sun specs after you trying to find the owner of the gilet! Thanks dogplodder, the area was very photogenic! The two were completely separate events, it does make you wonder about karma though. The area absorbed me completely, it was a wonderful experience. Not sure about having mastered the art of going light. I'm good at stuffing my rucksack to the brim! Thanks Jaxter! I expect you'll be racing round these in 20 hours! simon-b wrote: Well done, Silverhill. That's very efficient, managing it all with a 32 litre pack. A great, wild area, and congratulations on the 200. Thanks simon-b! I look forward to reading your compleation report! Enjoyed that . 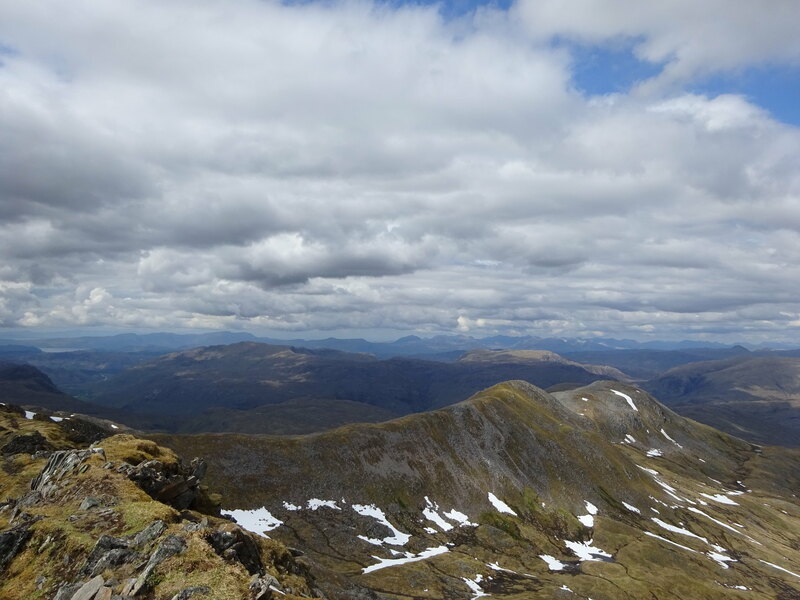 Despite being local(ish) there's still a few sections of ridge I haven't been over in there. Looks like you had decent weather for the most part too - which definitely helps! Well done Silverhill on a great trip, report and for getting to 200. Your report is timely. I am planning to do these over 2 days in the coming days.